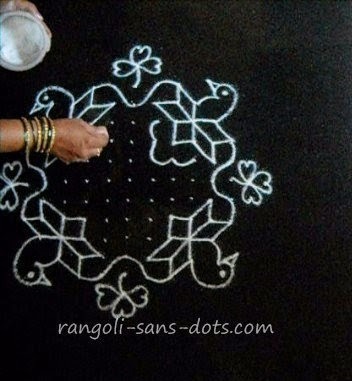 While free hand rangolis are popular in many parts of India, rangoli with dots called (pulli ) kolam in Tamil is popular in Tamil Nadu (chukkala muggulu in Telugu or pulli vecha kolam of Tamil Nadu ). This can be further classified into two types ner pulli kolam and idukku pulli kolam. 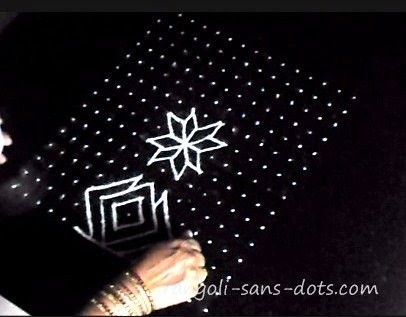 Some of these kolam designs may be useful for Margazhi kolam too or if you are looking for Sankranthi / Pongal muggulu with dots. These are also called tipke rangoli designs or tipkyanchi rangoli designs by my eleder sister in Mumbai. 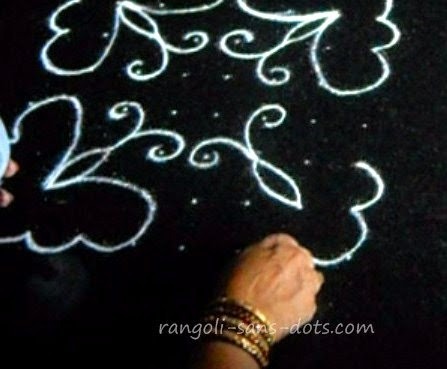 If you are looking for Ayudha Pooja kolam or Saraswathi Pooja kolam or Vijayadasami kolam one of these 25 plus rangoli designs should be useful. 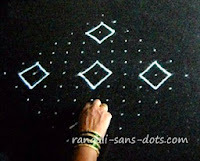 To explain it further if one draws a ner pulli kolam with a 15 to 1 dot pattern it means that the central row of dots is 15 and the last row has one dot - odd number of dots are placed in descending order i.e 13,11, 9, 7,5,3 and 1 and a convenient distance (1 cm approx) on either side of the central row of 15 dots. In idukku pulli kolam also called idai pulli kolam or sandhu pulli kolam ( all refer to the fact that dots are placed in between ) the first row of dots is placed, the next row of dots is placed below the first row in between the dots of the first row and the third row below the second row at a reasonable distance between the dots of the second row and so on. This is to be done on both sides of the central row. 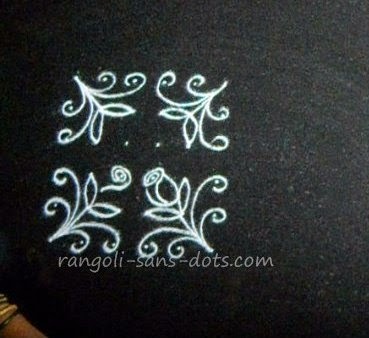 Some pulli kolam designs I designed for Rangoli-sans-dots. I will upload as and when it is possible. 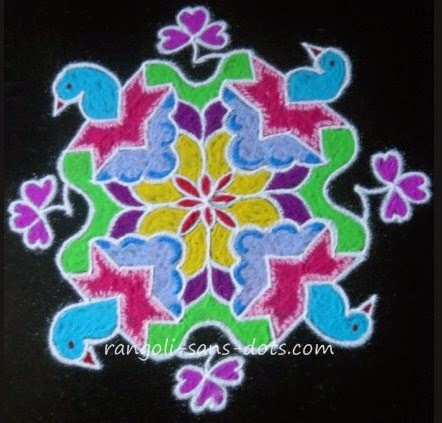 The kolam above on the top is of 9 dot to 1 dot pattern kolam with four "colourful" birds. A simple design. Place the 9 to 1 dot template. Draw the central pattern and expand outward to get the wings Draw the head and crown and beak of the bird. The remaining dots at the centre are filled up with patterns as shown in the image. You can also decide your own pattern. 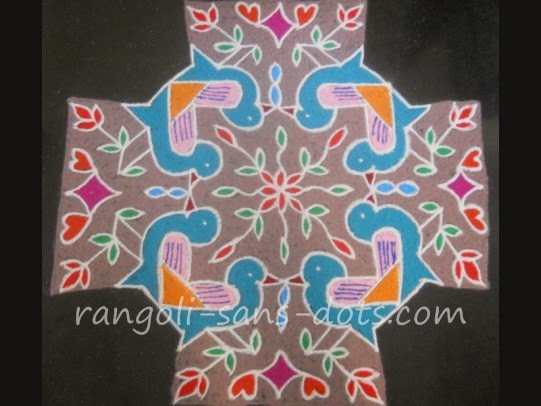 There is some influence of free hand design in the birds and hence the combination of dots and free hand rangoli results in the image shown above. 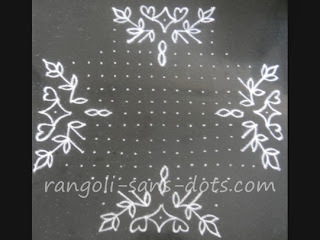 Some colourful lines have been added to parallel to the basic white design to get a beautiful and attractive rangoli. 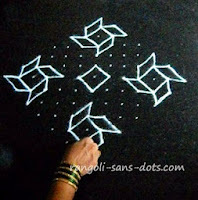 This rangoli may not appear to be simple, hence the photo above showing how to draw the basic patterns at the centre and around. From this the beak, crown and tail of the birds can be developed based on our imagination. Two pictures showing intermediate stages of the kolam. Drawing the wings is the only difficult part. 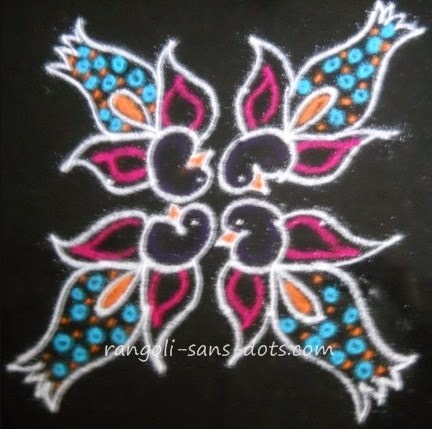 This kolam is somewhat different because free hand patterns have to be drawn for representing the birds. Decorations and colours are added as per our convenience and imagination to complete the design. In the second case, the central star design is retained to get the 12 sided geometric shape like a star. Two sides are used to draw the free hand design of the bird as shown. Add beaks and crown and some colours to give a more bird-like presentation!. 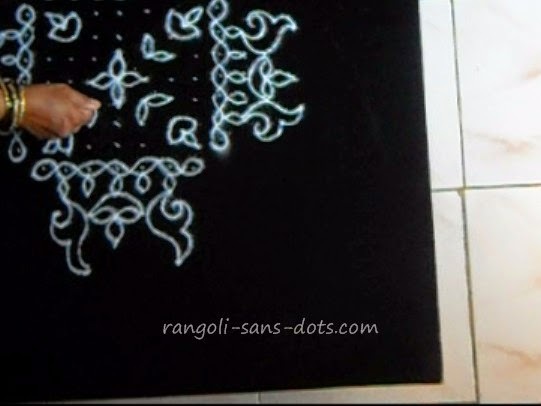 A simple method for drawing birds on a rangoli. This rangoli below is a birds rangoli ( supposed to represent a simplified version of peacocks !). 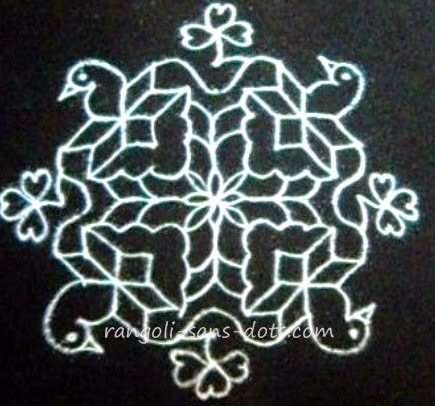 It is 5 dot rangoli with 4 birds. The dot grid is 5 by 5 . 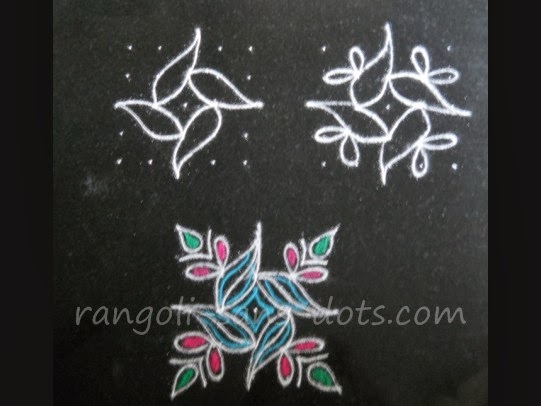 The steps showing how to draw this design and also the same design with different colours are there in a post on dotted rangoli in Rangolisansdots . Two intermediate steps are shown in the images. 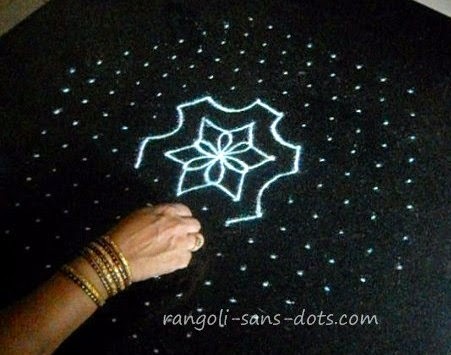 Such kolam will be helpful if we are really short of space. 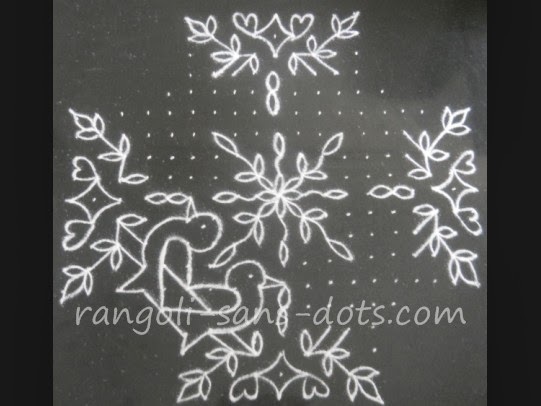 Simple kolam with 7 by 4 dots for Margazhi. 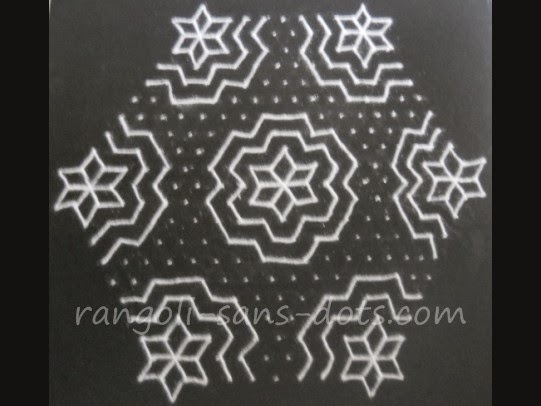 This kolam uses a 7 by 4 idukku pulli or dot pattern. After placing the dot pattern instead of connecting the dots. The lines are drawn on either side of the dots to get six intersecting patterns. 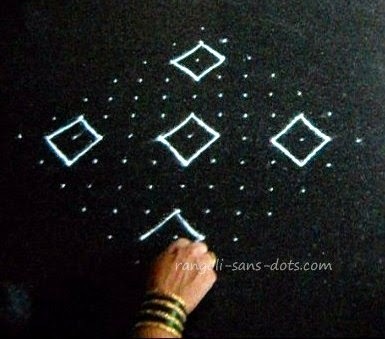 Finally the remaining dots are used ( again the lines are drawn outside the dots ) to get the simple kolam. Two intermediate steps are shown in the two images below the kolam. 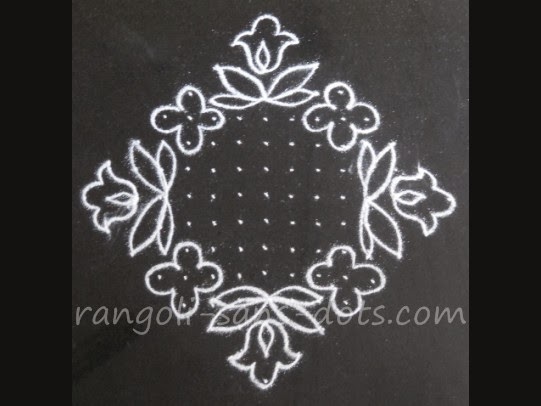 If you are looking for a small and simple kolam with dots for Margazhi this may be useful. 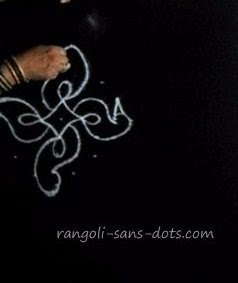 So far I have posted many free hand rangoli true to the title Rangoli-sans-dots which means rangoli without dots. 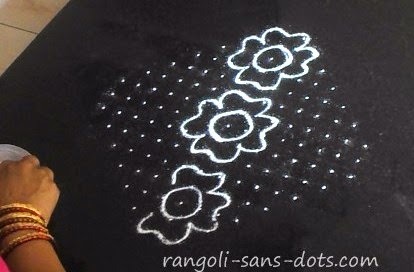 However rangoli with dots are also beautiful and have their own appeal. I can draw a few, thanks to my mother-in-law and mother who taught me some of this type. 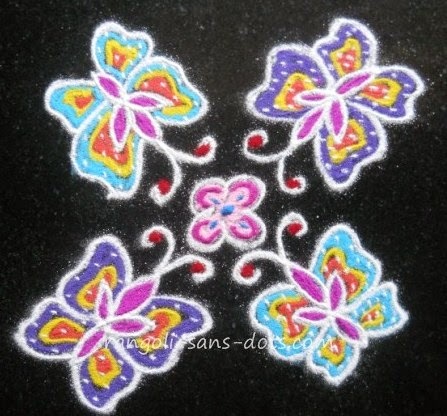 In this category of kolam designs, the second kolam is a 7 to 4 dot kolam with floral petal designs. 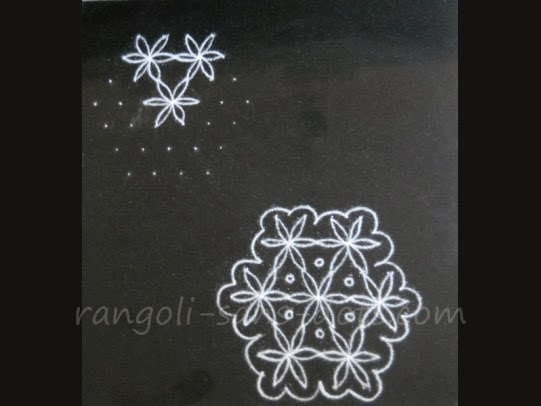 The black and white image shows the two steps of the kolam, the first one with the dot pattern and the second kolam is the white kolam stage. The completed kolam is shown in the next image. The background is filled with any kolam powder according to our choice. What I have done is four petals have blue or pink colour and the bottom two are green in colour ( to represent leaves !). 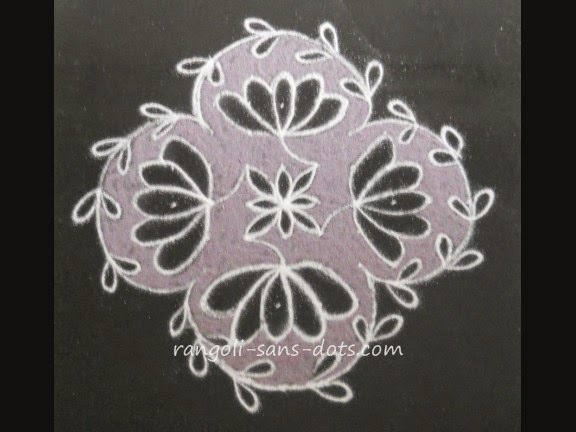 We can add some simple patterns on the back ground and inside the petals to enhance the beautify of the kolam design. 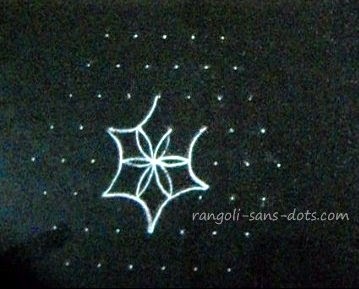 The rangoli on the top below is of dot grid 11 to 6 dots (idukku pulli). A floral design with dots. 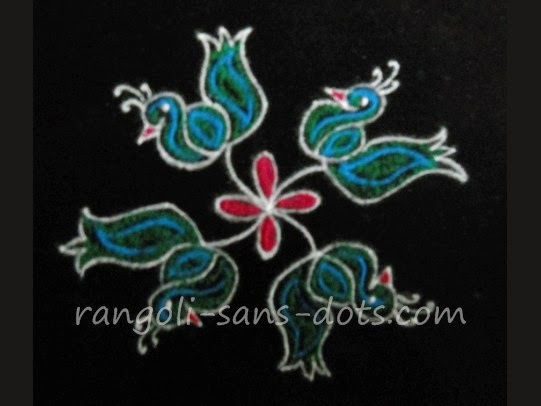 They are the most sought after in rangoli designs. Probably the beauty and colours of flowers attract us so much that we desire to draw them often. 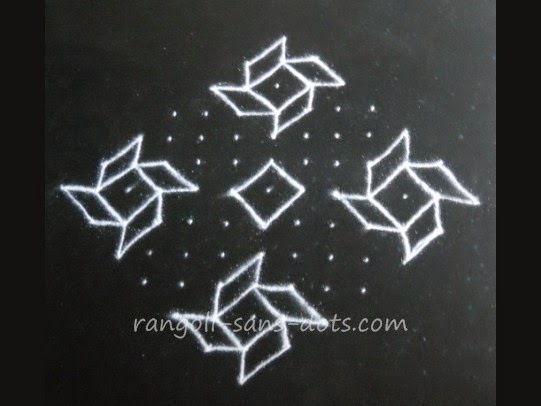 Though it is preferable to upload videos for rangoli with dots, simple rangolis and for at least some of the free hand designs so that the steps involved are shared with viewers, I have a separate channel for the videos . 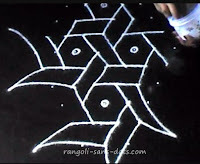 Accordingly I try to include videos for pulli kolams, simple kolams with dots and for some free hand rangolis. 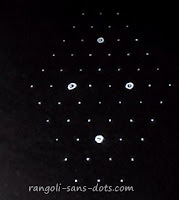 The dot pattern for the third kolam shown above is 15 to 1 (ner pulli). Draw the four outer diya or lamp designs and then the lamp and floral designs at the centre. 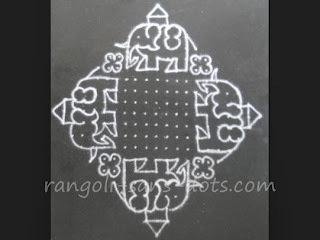 This is also a simple kolam but again with influence of free hand rangolis in the motifs on either side of the lamps. 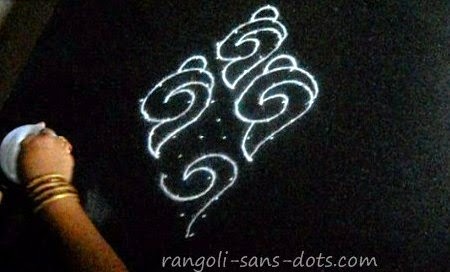 Fill the remaining areas with light and dark brown rangoli powder Below, the same design without the gaps being filled up. Filling up the gaps will take some time and needs patience! 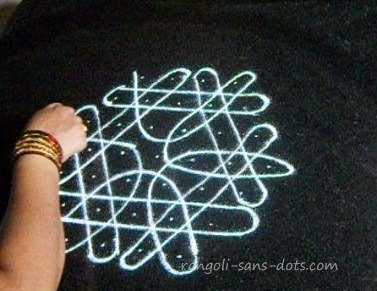 Two intermediate steps of the kolam in the photos below. 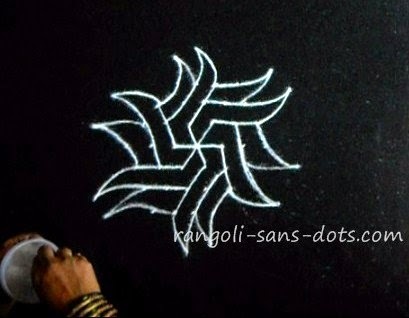 A kolam that can be drawn for Margazhi also because we prefer bigger kolam designs during Margazhi upto Pongal. Here the central portion is not filled with colours. This is also beautiful. We can fill the black background with a colour of our choice and that will too look beauitful in its own way. Only we may need 10 to 15 minutes time and patience (!) to fill the colour. 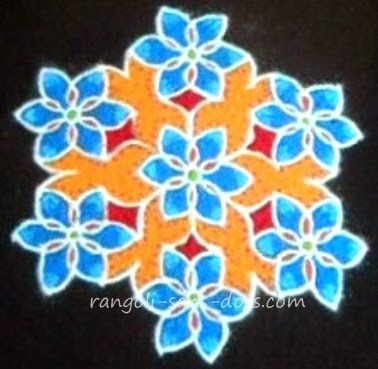 Rangoli designs are popular is various states of India. Each state has its own style and each style its own beauty. 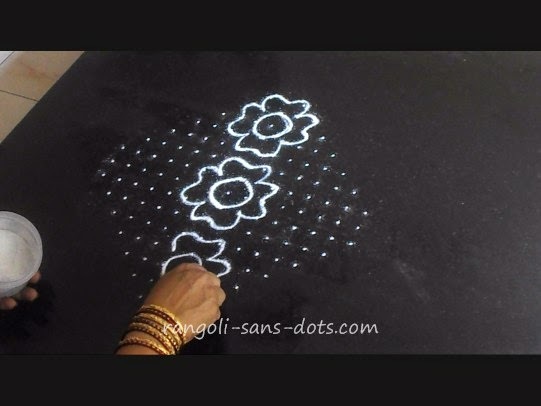 While kolam including pulli kolam is unique to Tamil Nadu, rangoli designs with dots with square dot grids are unique and the beauty of rangoli designs practised in Maharastra. 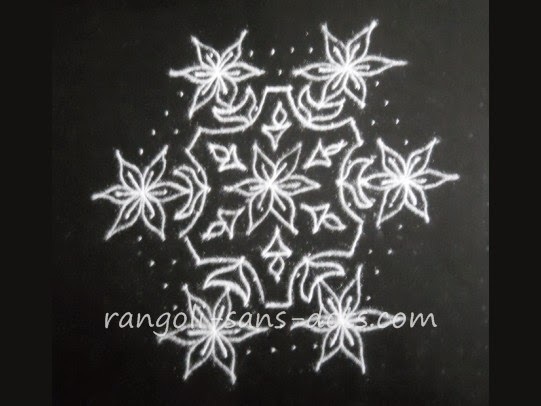 Some rangoli designs inspired by Maharastra rangoli with dots based on the feed back from my sister who lives in Mumbai. 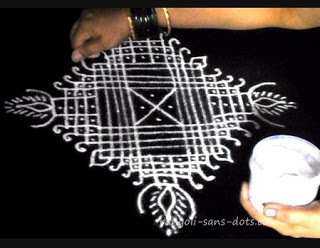 kolam designs above 15 dots may ( can ) be classified under an intermediate category, they are neither small nor are they very big. They can be drawn for festivals like Margazhi, Ugadi or at the entrance of kalyana mantap ( wedding hall ) . One such design below. It is with a 15 dot to 8 dot grid ( The dots are idukku pulli type - meaning that after a row of dots is placed the next one is placed between the previous row of dots and below ( or above ). Consequently, the number of dots reduce by one in each row - 15, 14, 13, 12 till 8 dots in this case. 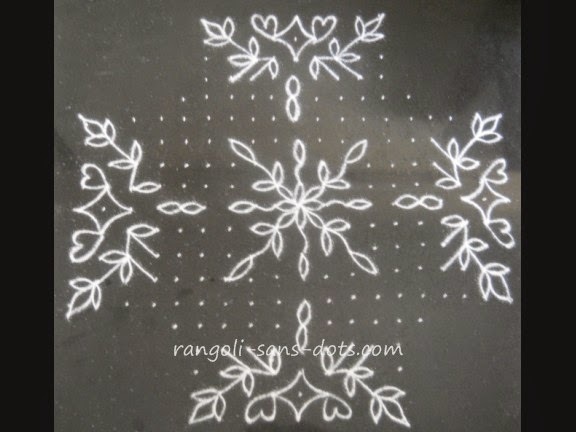 The plain and white kolam. 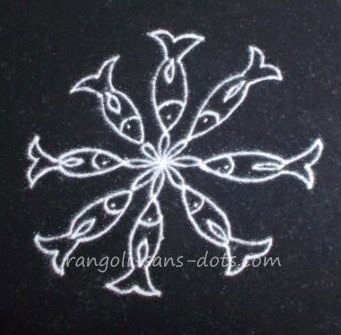 White kolam designs are beautiful in their own way and are widely used in Tamil Nadu, daily. In the kolam with colours I have chosen to hide the ribs drawn on the floral patterns by adding the colours. We can also add the ribs again after filling the colours. 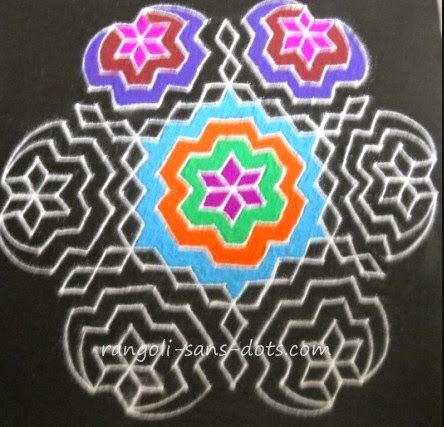 This image represents an intermediate stage of the kolam design after drawing the 7 floral patterns. The design at the centre and the patterns connecting the dots between the inner designs and the outer flowers are drawn. The image below shows the dot grid for reference . The distance between the dots can be chosen according to our convenience depending on the space and time available. The more the distance the larger will the kolam below and hence occupy more space and will take more time to complete and add colours.. The image on the right shows an intermediate stage of the kolam after completing the 7 floral designs. 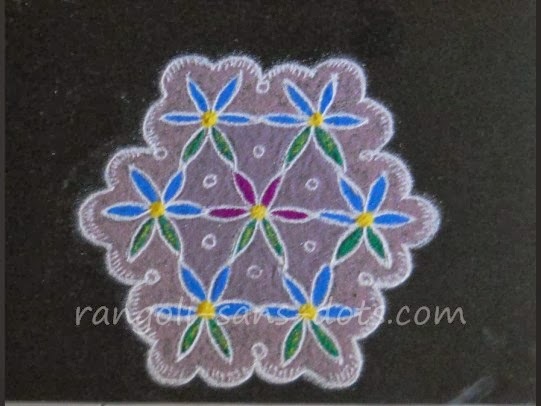 The first kolam in this series of kolam inspired by Maharastrian rangoli - a lotus design. 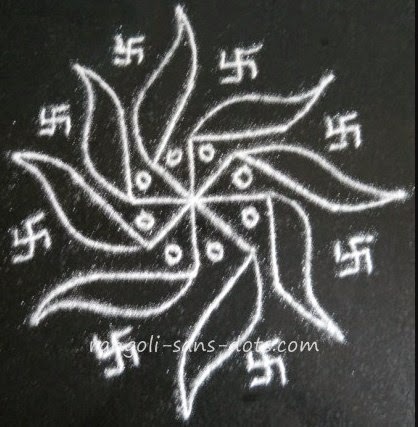 It is common lotus kolam design that is drawn during Margazhi and Pongal in Tamil Nadu. Obviously even when I try designs I am not very familiar with there will be some influence of my style. After all as my husband says - Regimentation suppresses creativity. So this lotus design is my kolam inspired by Maharashtrian rangoli. The dot grid used is 15 by 15. After placing the dot grid identify the centre of the dot grid and draw the geometric shapes representing petals. Then identify the central dot in the last row and draw the petals of the lotus as shown. 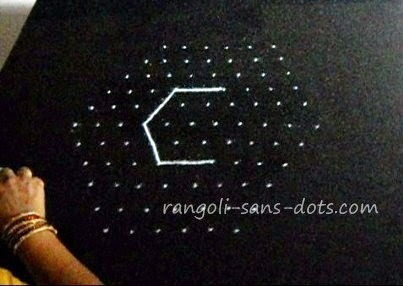 Actually once we start this rangoli, the dots will seem to show up and ask to be connected!. After drawing the four lotus patterns the remaining patterns at the four corners can be drawn according to our imagination. Draw a petal at the base of each lotus to make it appear more natural. There are four remaining dots at the centre. I have used them with some circles and dots as shown. Fill with pink lines for the lotus. 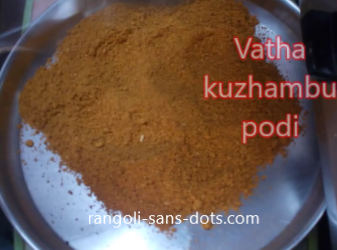 This may be useful if you are looking for a simple but grand Tamil Puthandhu kolam . 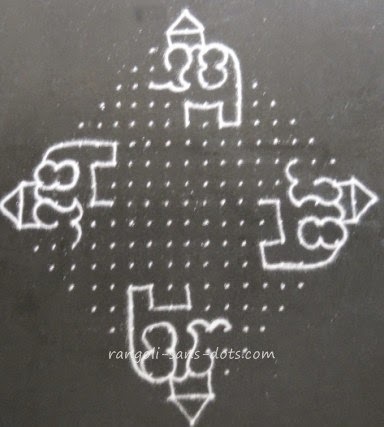 The previous kolam witth a square grid and this one appear to have the influence of Maharastrian rangoli with dots. 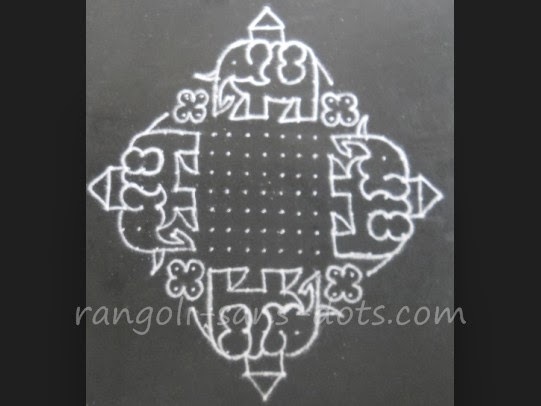 This kolam is also with with 15 by 15 dot grid using a number of straight lines that is usually drawn for the festival Ananta Vratha and appears to have the influence of Maharashtrian rangoli with dots with two photos showing the intermediate steps are shown below. 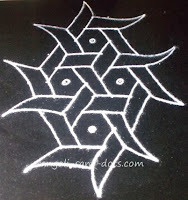 The result a beautiful kolam design. 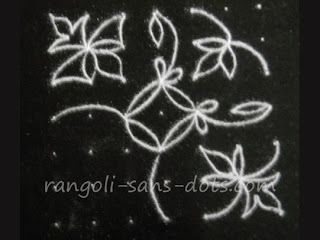 Through simple steps and simple patterns it is possible to get beautiful designs in this type of rangolis. I hope to add more of them in future. 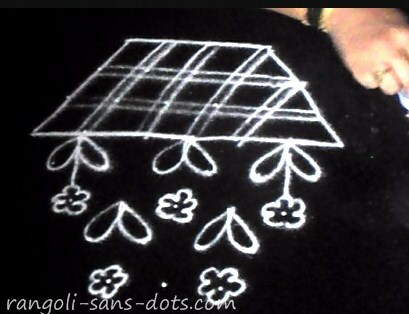 The kolam above is of dot grid 15 to 1 (ner pulli). Though it is with 15 dots it is relatively easy to draw. The patterns below the neck (that represent the wings! are drawn first on the four sides. The central floral pattern is added. Then the birds and flower at the centre are connected with dots as shown. Finally floral petals are also added between the birds. The beauty of this kolam lies in the symmetry of the patterns. Interested in seeing how it is drawn with colours . The colourful version I drew for Tamil New Year . 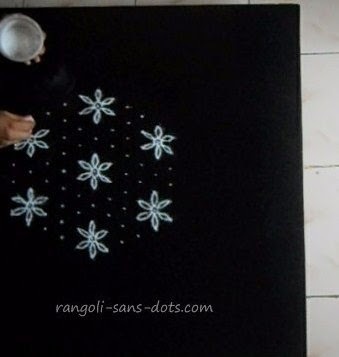 The rangoli on the top is a Tamil New Year special it is a rangoli with dots of 15 to 1 dots pattern (ner pulli kolam) i.e the dots decrease from 15 to1 in odd numbers (15,13,9,7,5,3 and 1). This design, initially was to be butterflies and flowers combination but I changed it to birds and flowers pattern as I drew it. The level of difficulty I presume is medium. 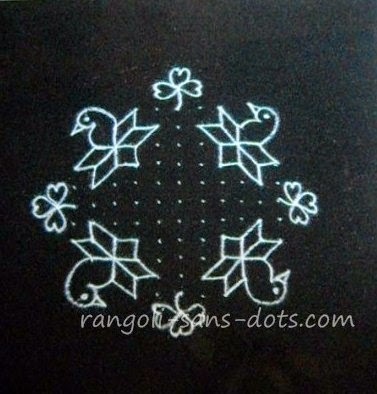 The two more black and white images are two intermediate steps of the 15 dot kolam taken from Rangolisansdots. 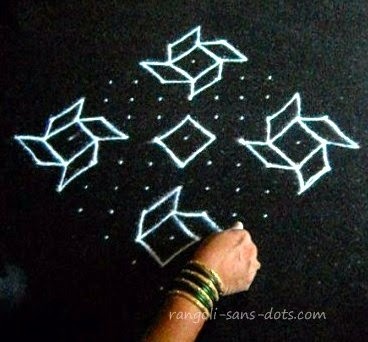 They should give an idea of how the kolam is drawn from the dot grid stage. The next kolam is of dot pattern 11 to 6 (idukku pulli). This is a simple floral design. Draw the 6 flowers around the central flower. The gaps between the flowers are converted into simple designs using the remaining dots. 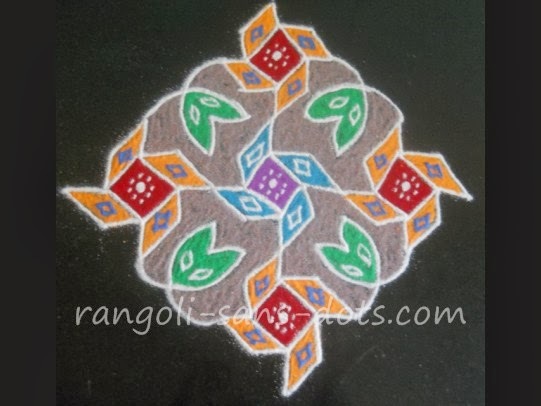 Finally fill all the designs with colour rangoli powder to get the image shown below. The trick is to get the floral petal patterns at the centre and on the outside, right to get a beautiful effect on the rangoli. The colours only enhance the beauty of the design. Choosing colours can be left to our imagination for general floral designs but for specific flowers like rose, lotus and hibiscus there are restrictions. 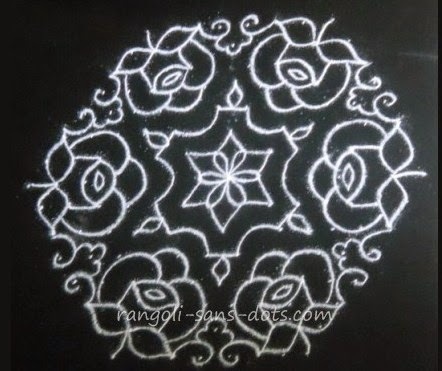 The black and white images show two stages of the kolam. 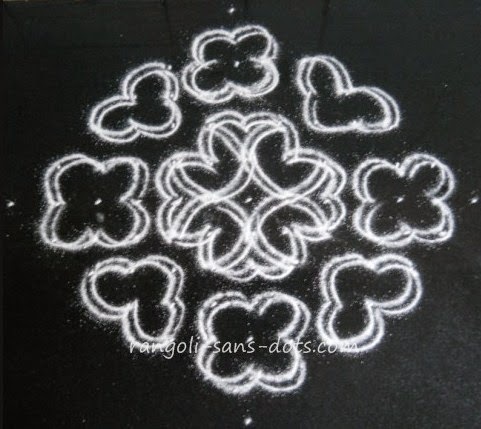 A flower kolam for Margazhi. The kolam is 15 to 1 straight dots (ner pulli). A simple floral petal central design surrounded by some flowers and leaves. I have added a few colours The method is - draw the outer designs on the four sides. Then draw the central floral designs. Connect the designs as shown. Fill with parallel lines of different colours. 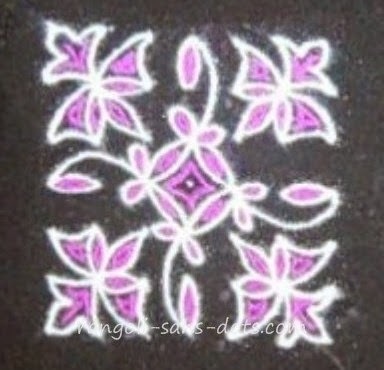 The pattern at the centre is a simple floral petal design and this I have used in some rangoli designs. 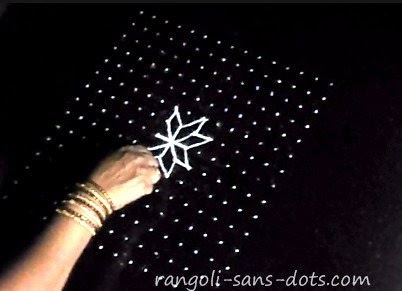 The remaining dots are also used to get more flower and leaf patterns to get the rangoli. Two intermediate steps of the colourful design above are shown to give an idea of how the kolam progresses from the dot grid to the final stage. As shown in the first image the floral patterns on the four corners are drawn and then the dots between the floral patterns are used with a pattern as shown. Of course we have the liberty to change the designs according to our imagination. For example some leaf patterns can also be drawn in these dots. The next image shows how the dots at the middle are used. Three dots on each side remain as shown. 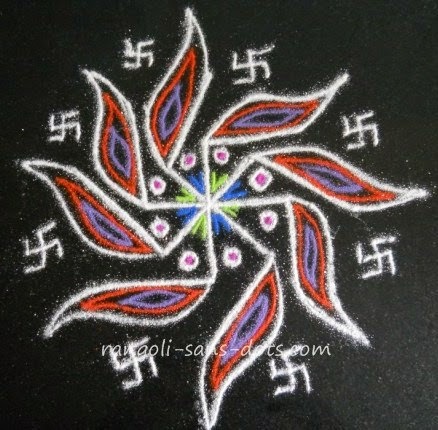 Refer to the final image with colours to complete the kolam design. The next one is with 7dots to 7 dot pattern. A simple floral pullikolam design. . Again the outer designs are drawn and the remaining dots used to get the central design. The outer patterns can also be converted into birds or butterflies - the patterns on the four edges - as is obvious from the image. 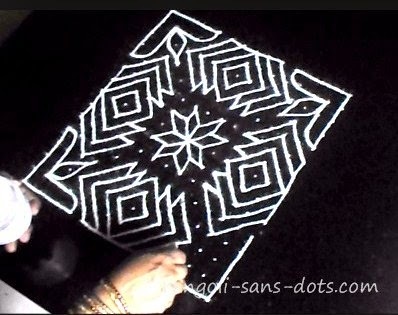 The images in black and white show two intermediate steps of the kolam design. The first one shows the dot pattern with the outer floral designs in three stages. The second image shows how the central designs are drawn. They give an idea as to how the kolam design progresses. A representation of a flower basket in a kolam through three images. The dot pattern is 7 to 3 idukku pulli. 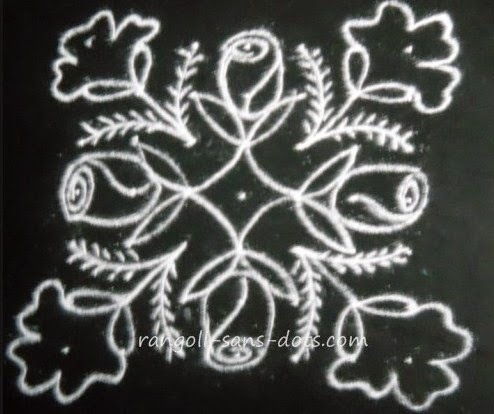 The next one on the top is also a rose kolam design but with the dot pattern 6 by 6 so it is relatively simple, only drawing the rose buds with curved lines needs some practice. Start from one corner, draw the stalk and the leaves and finally complete the rose buds. 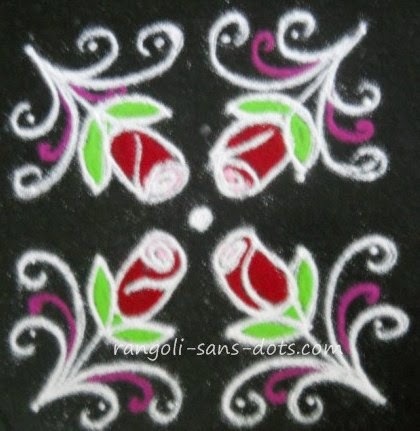 Red rose buds have been drawn in this kolam design. 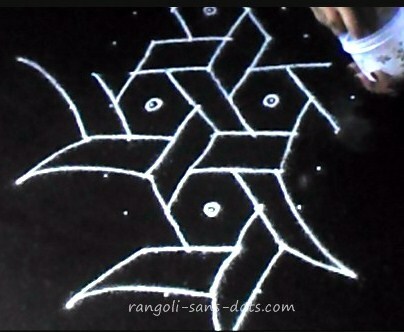 The images in black and white show the kolam at the beginning and at an intermediate stage before addition of colours. 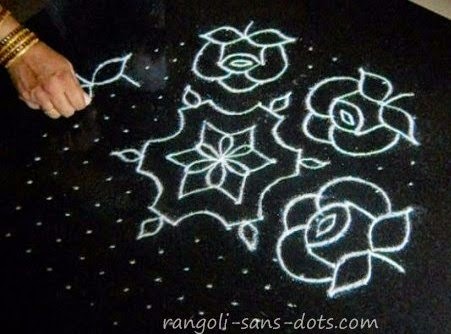 This may give an idea as to how to proceed with this kolam. I wanted to try something different. 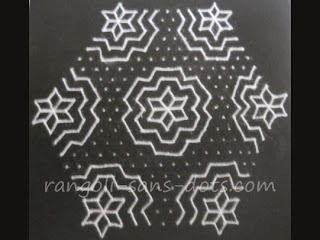 This one is a kolam with a dot pattern 6 dot by 6. Frankly, this design is not what I planned but as I stated many times the influence of free hand designs makes me change the design while drawing. A kolam with four "angry birds" says my daughter(!) because all birds have turned their heads away and are not looking at one another. 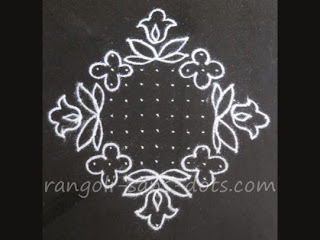 This kolam design above is a common kolam and is with 13 to 1 dot pattern. It has been filled with colours, however can be drawn plain or partially filled, can be decorated inside or outside with freehand patterns. The options are many. 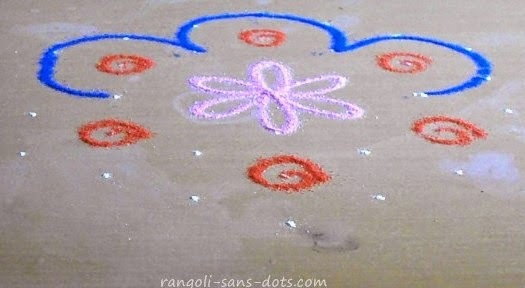 Rangoli with dots are the popular in Tamil Nadu, Andhra Pradesh and Karnataka in Southern India. They are called chukkala muggulu in Telugu. The next kolam is quite a common design - the dot grid is 15 to 8 ( idukku pulli ). It is usually drawn as a tortoise shape but I have used some floral patterns instead of a tortoise. Draw the central star shaped patterns then use up the remaining dots to get two parallelograms one inside the other. Though it is a relatively big kolam and occupies some space it is commonly drawn during Margazhi at the entrance. The next one is a kolami that is quite common in southern part of India ( at least to my knowledge ). The dot grid is 11 to 6 ( in between dots i.e the dots are placed in the order 11at the centre and 10,9,8,7,6 on either side ). First 11 dots are placed the next rows of dots are placed below and above between two dots in the 11 dot row so that we get 10 dots. Similarly when the next row of dots is placed between any two dots we get nine dots and so on. 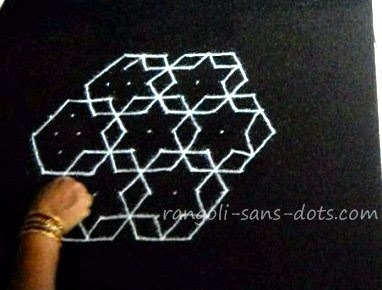 This is a simple line rangoli design with hexagons and few lines so that the result is rhombuses. 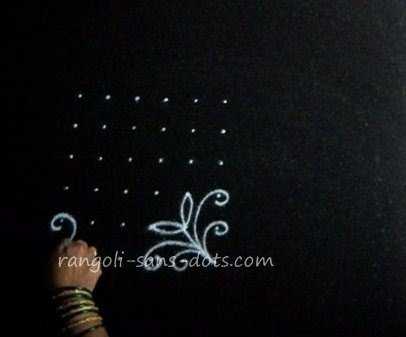 Two intermediate steps are shown one at the beginning and one when it is nearing completion so that the rangoli can be drawn for colouring. 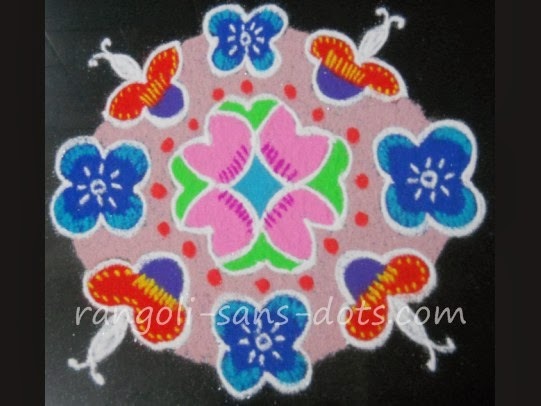 The colourful version is in rangoli with 11 dots. 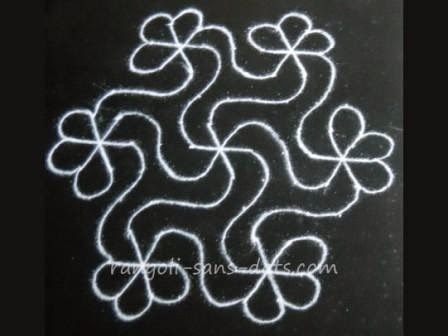 There are some common kolam designs that are drawn quite frequently in many homes. 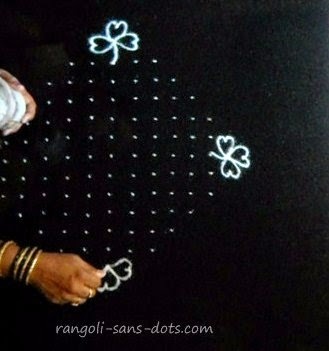 One of them is the 11 to 6 dot s ( interlaced dots or idukku pulli ) poo kolam. Actually it is not a poo ( flower ) but only some petals are drawn. 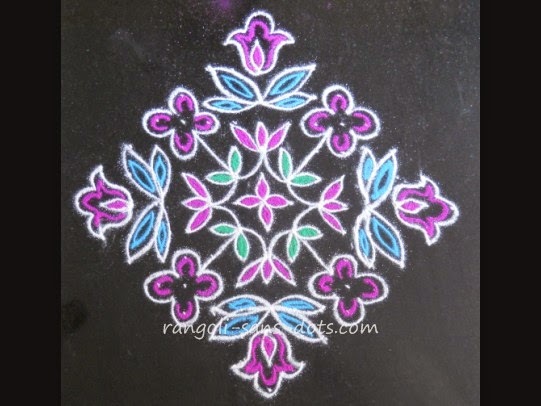 The colourful version of this kolam is already there in Rangoli-sans-dots. The kolam is shown in three steps below. In the first image three intersecting lines are drawn using the dots as shown. In the next stage the petals are drawn and they connected through curved lines drawn through the dots from the centre. In the final step the the remaining line below the floral petal is connected to the next group of petals using the remaining dots. 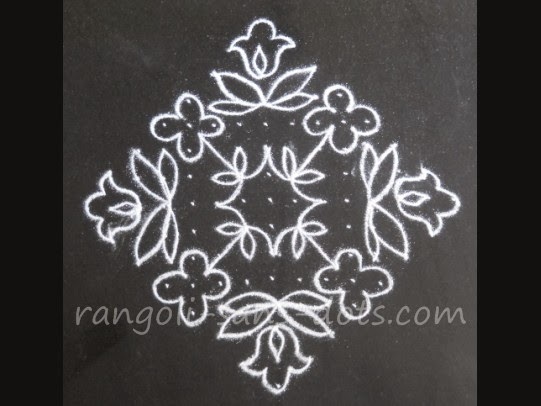 This simple yet beautiful kolam may be useful for beginners and kids. 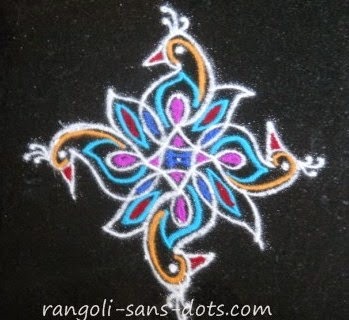 These two kolam shared below have already been shared with colours elsewhere in Rangolisansdots. 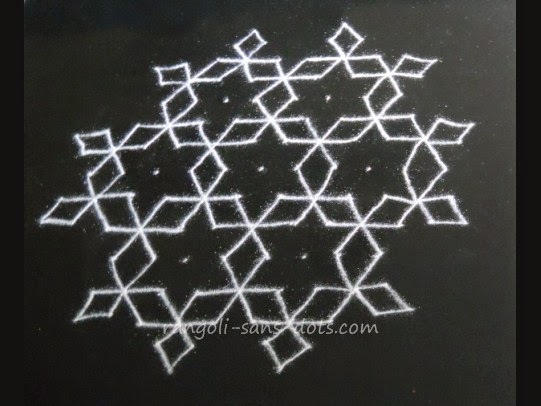 Such simple kolam though drawn with a bigger dot grid may be useful for activities connecting the dots. for learning by beginners and children. The kolam is a 9 by 5 dots ( idukku pulli type ). After the dot grid is placed the two images in black and white show how the kolam progresses from the centre. Though it can be left plain, since it is Deepavali adding colours is an important factor. So the kolam with colours. 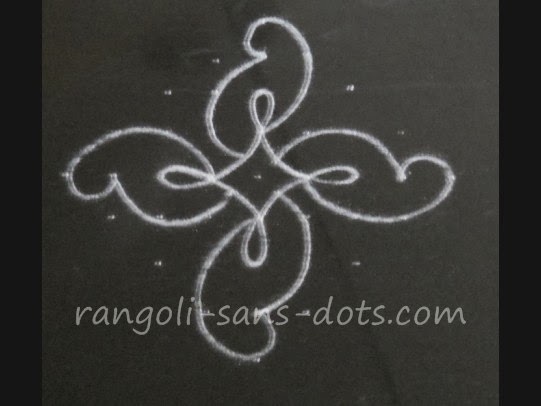 The plain kolam has also been shared elsewhere in a relevant post in Rangoli-sans-dots. 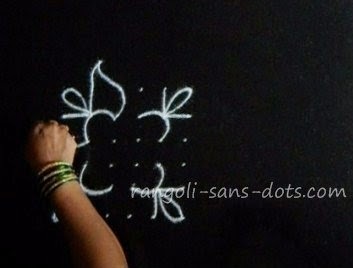 The newest addition to this series on Deepavali kolam ideas . It is a 15 to 1 ner pulli type kolam. As usual place the dot grid. 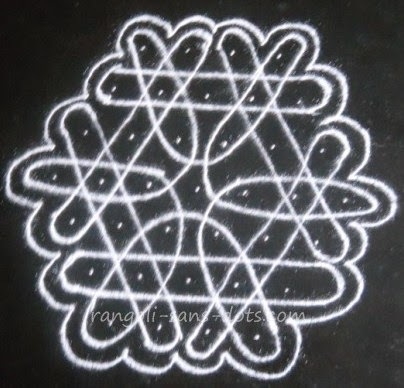 Draw the kolam from the centre towards the outer sides. First draw three intersecting lines as shown. On the top of each line draw the petals shapes filled with orange colour. Four floral petal designs on four sides are complemented by four deepam designs with yellow flames. Four more deepam designs are added on the four sides. So far so good. Filling up the kolam with various colours takes 45 minutes (approx ). And adding the final touches takes a few more minutes. 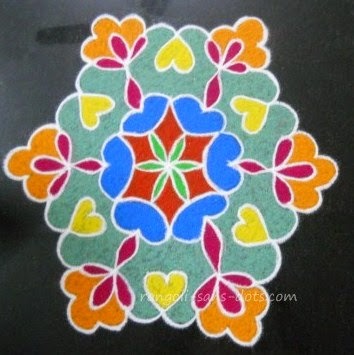 Actually the greyish green colour that can be seen is not a regular powder, but a mixture of different colours that was obtained when the Sanskar Bharti rangoli drawn above was erased. 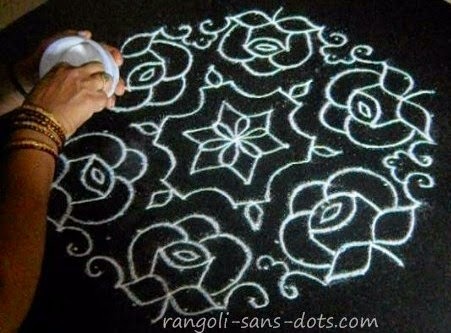 I made use of it in this kolam for filling up. 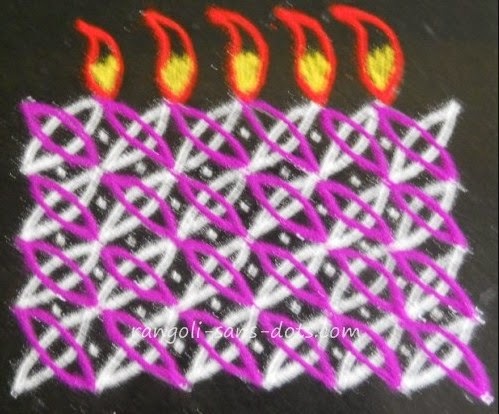 The kolam design on the top - I have already drawn in November 2012 for Karthigai Deepam. . It is very simple and we can decide the number of dots because the pattern is repetitive. I have adopted 6 dots to 5 pattern. Draw repeated elliptical patterns inclined on either side. 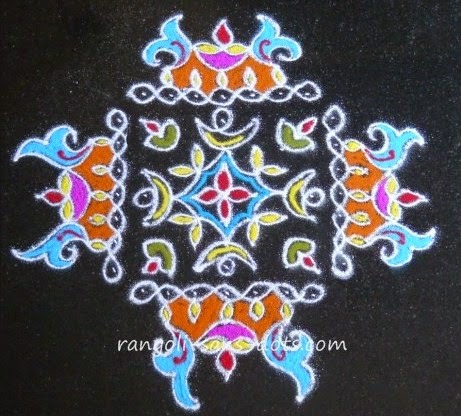 Depending upon the number of rows and columns we get a small or large diya rangoli design. 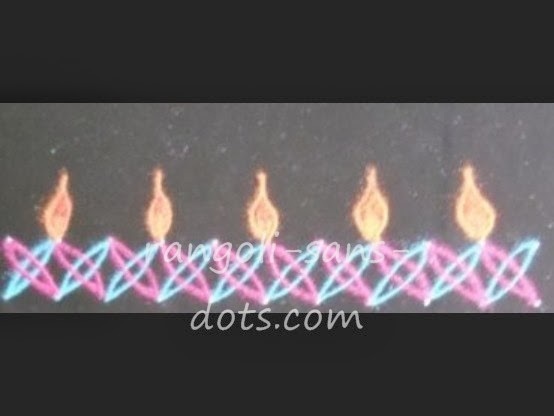 Two stages of this simple deepam kolam with dots are shown in the pictures above. 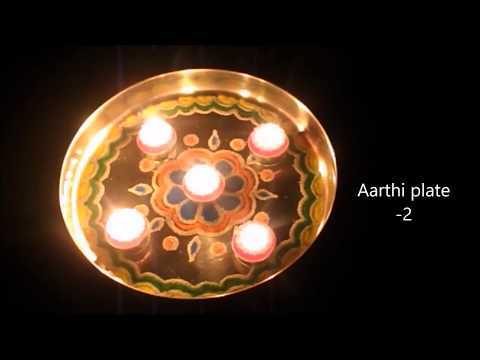 The next image also shows a deepam kolam for Karthigai. 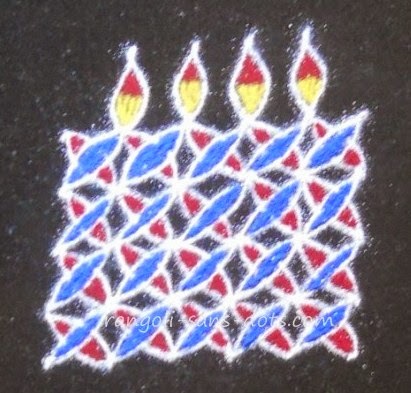 The base drawn in a method similar to what was used for the upper kolam design. 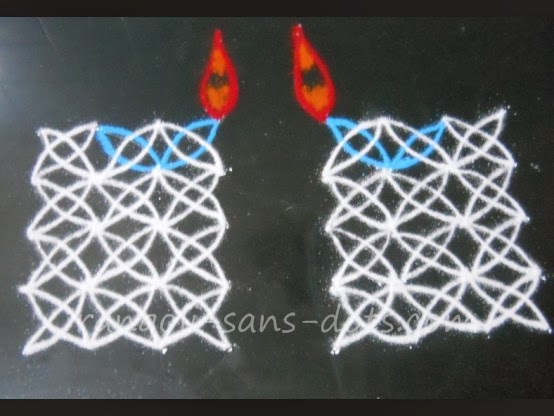 In this case I have drawn two deepam kolam designs with a suitable dot pattern. I have used blue colour to identify the lamp and of course red and orange colours for the deepam or lamps. 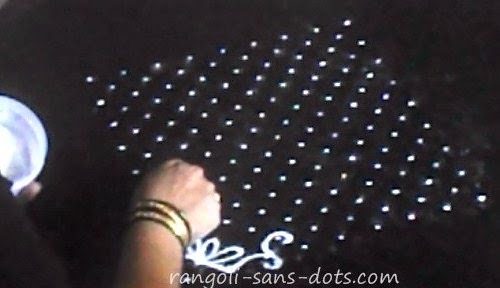 Using this basic dot grid and resultant pattern many different designs of deepam kolam can be drawn. The dot pattern is any number of rows and any number of columns i.e we can have 6 dot by 5 dot or 7 by 6 etc. to suit the size of the kolam we need to draw. .The kolam below follows the same idea of dot patterns the only difference being more colours have been used for the base of the lamp. The kolam on the top is a deepam kolam that I use for festivals. The base is drawn with dots. The dot pattern can be any number of rows and any number of columns. We should choose the right combination to get a rectangular or square shape. Of course the right combination of rows and columns also so that it is not too big or too small and also to ensure that the length and breadth in case of rectangular base is of acceptable size. After placing the dot pattern draw elliptical patterns as shown row by row, first draw all those inclined to the right and then those inclined to the left or vice-versa. The patterns can be all white or a combination of white and any other colour as I have done or a combination of two colours. Also the patterns can filled with colours. Finally add the free hand deepam at the top to get the finished kolam. This is the latest addition to this category of kolam with dots. The dot pattern used is 2 rows of 9, 1 row of 7 dots, 1 row of 5 dots and 1 row of 3 dots. 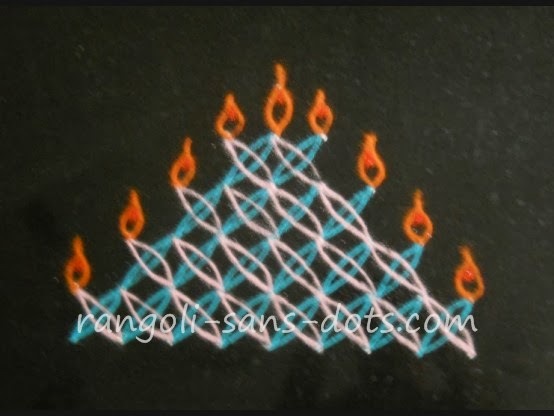 Following the method given in the pictures above draw the blue and white patterns and then add deepam designs as shown to get a simple yet beautiful kolam design with lamps. 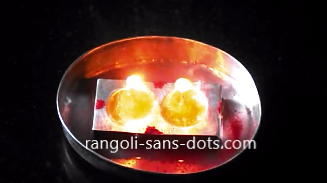 Deepam kolam with 2 by 2 dots ! Place the 2 dot grid for any number of times you wish. Join them elliptical patterns inclined to the left and to the right with two different colours and add diya or deepam patterns on the top. 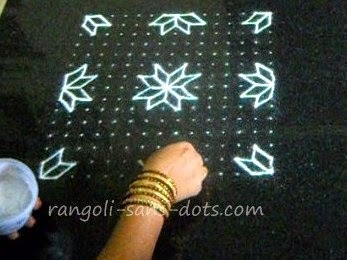 For those who are searching for a very simple kolam with dots for Karthigai Deepam or Deepavali deepam theme ! 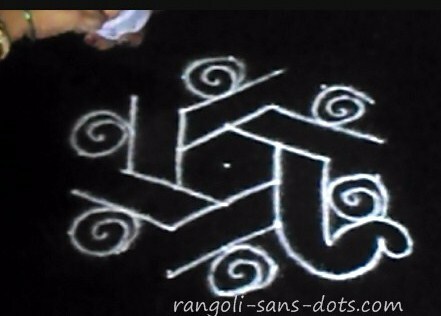 The rangoli has swastik at the centre and expanded further to end in petals. 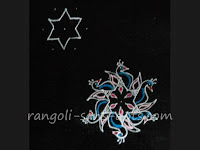 The periphery is also decorated with simple swastik patterns. After drawing plain, the petals and the pattern at the centre are filled with colour as shown in the image above. 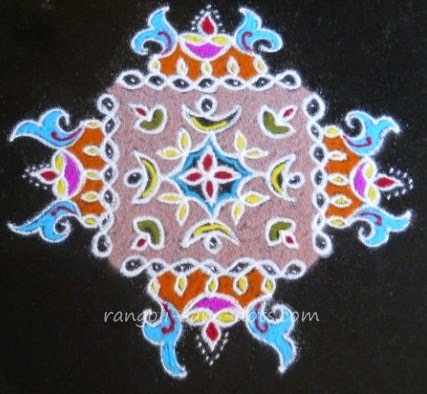 A simple free hand rangoli. 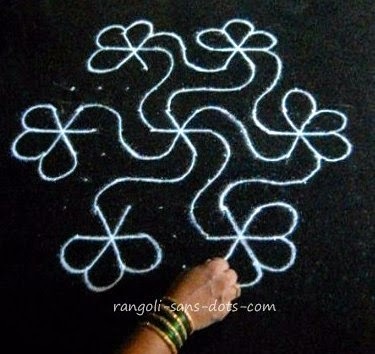 These types are similar to maavilai kolam in Tamil. They are drawn with dots. 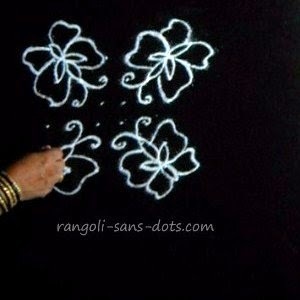 I am trying to be honest to Rangoli-sans-dots and hence I have tried without dots! When it is drawn with dots, The dot pattern is 7 dots at the centre, 6 and 5 dots on either side as idukku pulli and then one row of 3 dots each. As usual draw the design from the centre of the dot grid, add the petals or mango leaves and swastik patterns and finally fill with colours. Of course there is a small difference in the rangolis, the one at the top has eight petals while the one in the video has six petals. 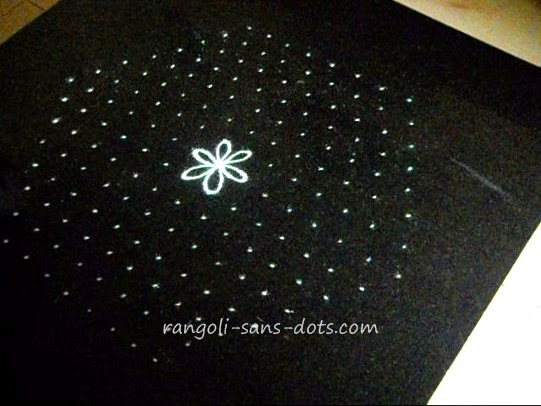 It is possible to draw a rangoli with 8 petals also. The video is in my YouTube channel. 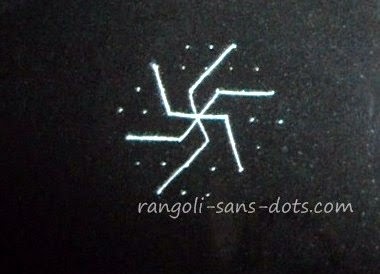 However, the two images below show intermediate steps for this swastik rangoli with 7 dots. 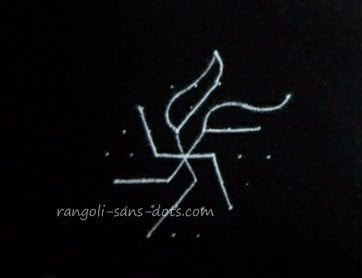 ( Swastik is regularly used in Indian temples and puja for centuries ). The white kolam on the left for practising without colours or for colouring activity. 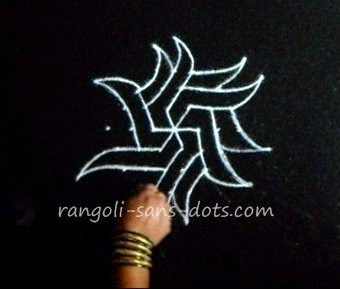 Continuing our discussion on maavilai the next rangoli is also a variation of the maavilai kolam (literally mango leaves). The dot pattern is 7 to 4 (idukku pulli). Draw the central intersecting lines, extend them and draw the curved lines to get the design. 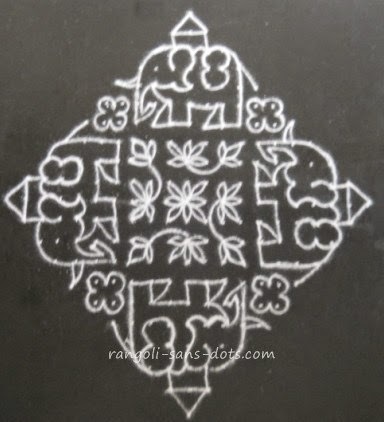 This is also a variation of the maavilai kolam (literally mango leaves). The dot pattern is 7 to 4 (idukku pulli). Draw the central intersecting lines, extend them and draw the curved lines to get the design. 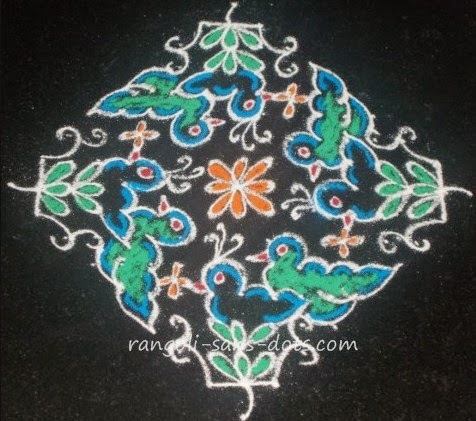 Margazhi is a season for relatively bigger kolam designs. So this one is some what big when compared to 4 or 5 dots. This has a 13 to 1 dot pattern. Using a dot pattern we can draw simple geometric shapes like triangles or parallelograms in a particular pattern to use the dots. This dot grid is also commonly used for such designs. I wanted to try a different design and got this finally. 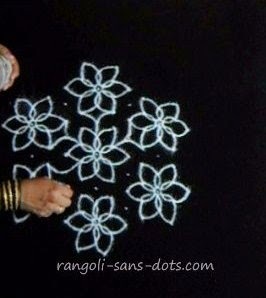 Plain rangoli designs can be used for drawing at the entrance of our homes, for practising this art and also for activities like colouring the designs. 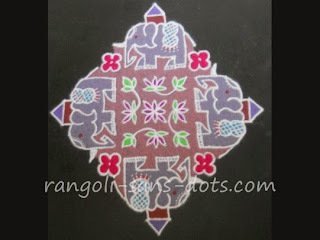 Hence some rangoli designs from my collection of rangoli designs from various places in Rangolisansdots. colourful versions of some of them may already be available here. 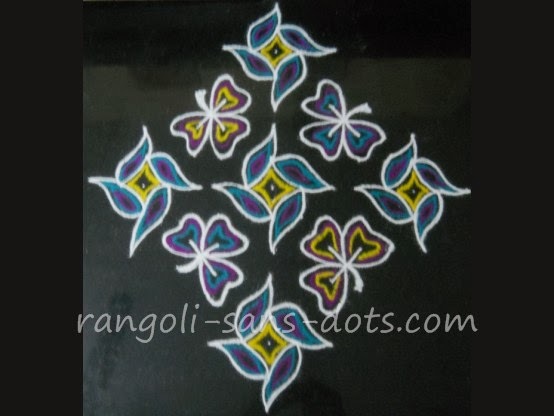 The rangoli designs can be used for filling with crayons, sketch pens or colouring pencils. 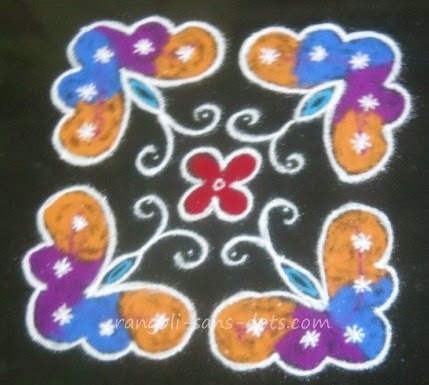 The white kolam below with colours in the kolam design above. Please compare the effects just adding colourful lines on the kolam. Akshya Tritiya is an occasion for learning a new art or mantra. 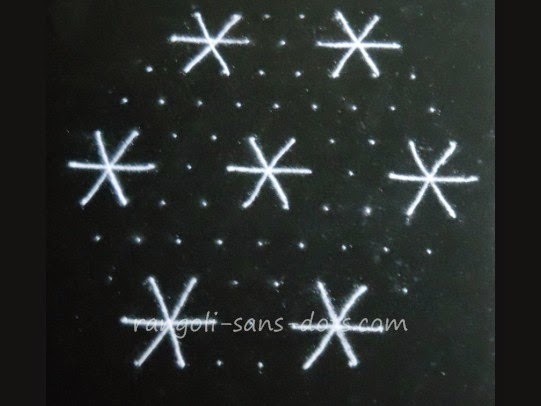 Some of these simple maavilai kolam with dots may be useful for Akshaya Tritiya considering the fact that these designs are considered auspicious. An auspicious kolam for an auspicious festival. 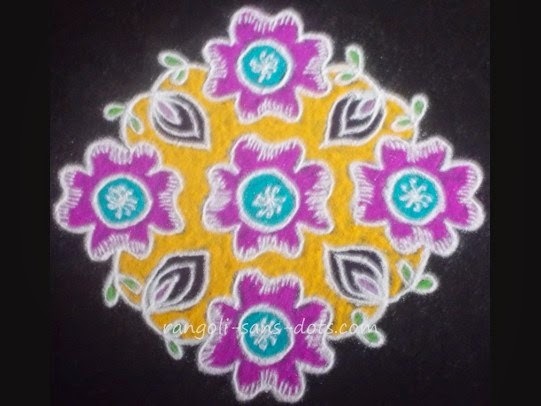 The colourful version of this kolam has been shared below. 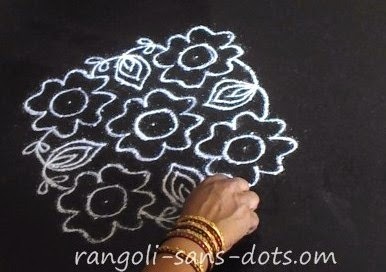 here a set of pics showing different set of steps to draw this beautiful kolam. 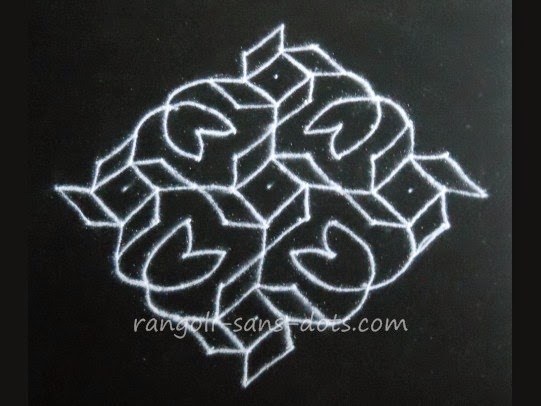 Though it can be drawn with a single line I have tried the double line or two line kolam version. The dot pattern is 13 dots to 1 dot, ner pulli. 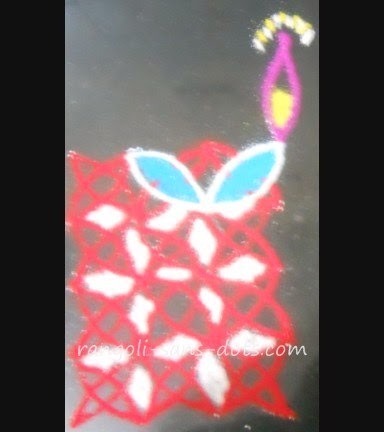 I have added the rangoli with dots. However I have drawn it with parallel lines instead of a single line version. 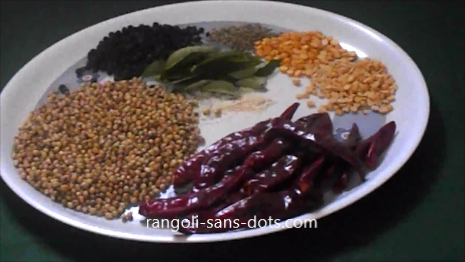 It reduces the use of colour rangoli powder!. 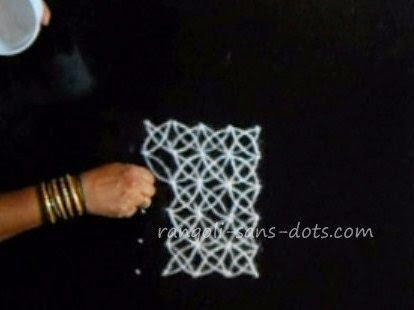 This version is also called double stroke kolam as two lines are drawn simultaneously.. Place the dots grid or template. Draw the butterflies and flowers first. Use the balance dots to get the image below. Add colours with lines parallel to the two parallel lines!. 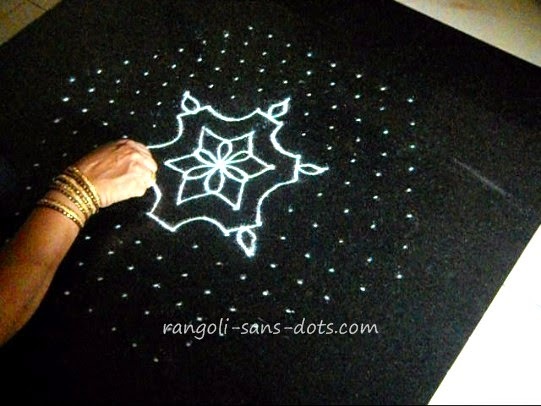 Rangoli designs with dots and those without dots are beautiful in their own way. So far as symmetry is concerned I think the level of difficulty is the same. The two images below show two intermediate stages of the butterfly rangoli to give a visual idea of how to proceed with this rangoli. If it is difficult to draw with parallel lines we can draw a single line design first. 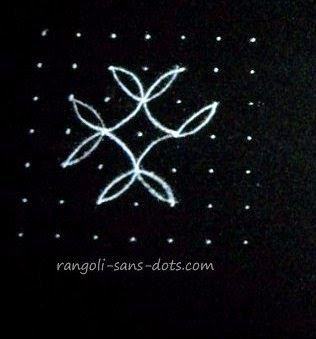 The kolam above looks like a free hand design after finishing but is actually a rangoli with dots. On an earlier occasion I wrote that we are dependent on nature for designs and colours for our rangolis. 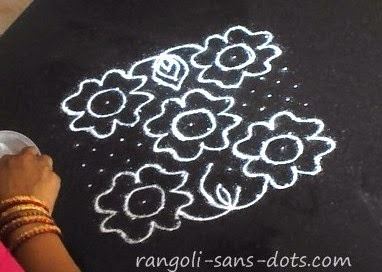 It is natural that we seek the help of colourful flowers, beautiful birds and butterflies for our rangoli designs. 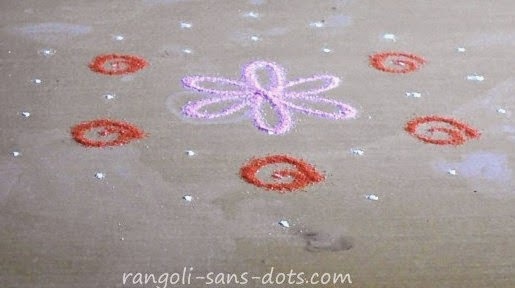 This rangoli is drawn by first drawing the four butterflies in the four corners - the body and antennae first as shown . Then add the four wings using the dots. Then draw the simple and easy flower at the centre. All the butterflies are drawn facing the flower. After all they should be shown attracted by the flower. Fill the wings of the butterflies with attractive colours and add simple and beautiful patterns according to your imagination. The butterflies should look colourful and beautiful. I have chosen similar colouring method for a pair. We can have them all of the same colours or all of different colours ( I don't know how this will look! Any way we can try - there is no limit or restriction for our imagination !) 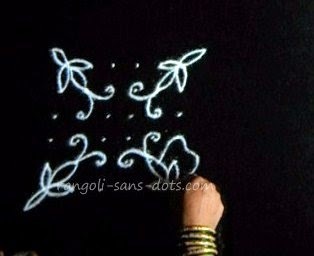 In case you still have a doubt as to how the butterfly design can be drawn with dots there is the video in Rangolisansdots my YouTube channel ! 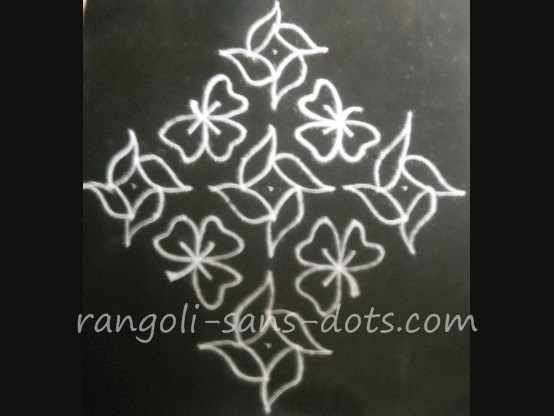 This is easy to draw with dots than free hand. . Two steps in the butterfly rangoli in black and white in the images above. The first kolam for the Margazhi season 2014. 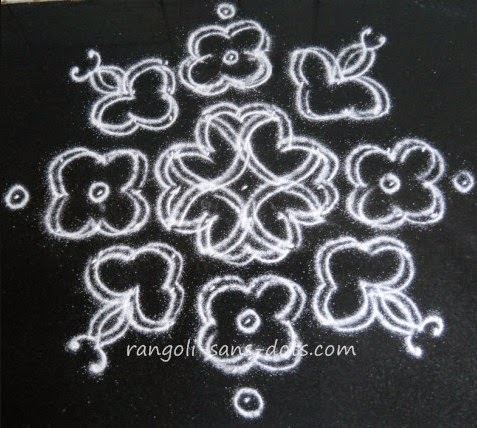 A flower kolam or poo kolam . 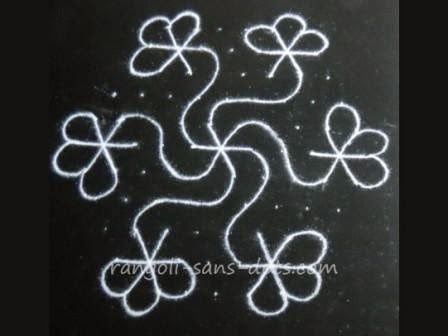 This is quite a common kolam design with five flowers each with four two lobed petals as shown. The flower is drawn at the centre of the grid and on all four sides. The remaining dots are used to create patterns as shown. Finally add some small leaf patterns. 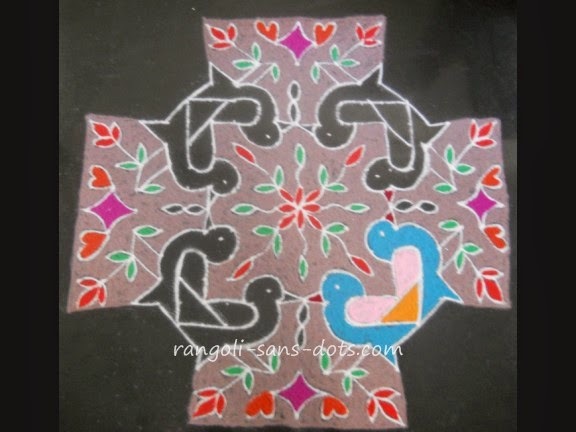 Since it is a Margazhi special it is important to fill with beauitful colours - the entire kolam - not only the designs but also the gaps are filled up with various colours, pink, yellow and blue as shown. The centre of the flower is also decorated with white designs. The dot grid used is fifteen dot three rows, then upto three dots (ner pulli ). 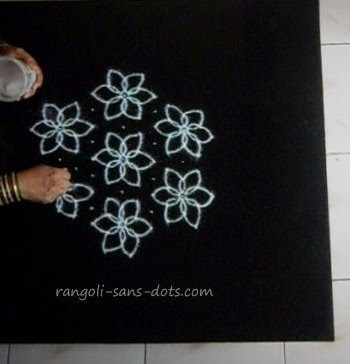 Though it is a 15 dot rangoli kolam it is quite simple and can be easily completed in a short time. Please try for this Margazhi. Intermediate steps are shown in the pics below. 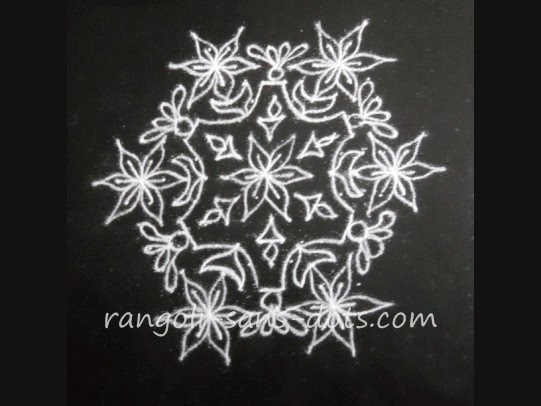 The kolam above with more intermediate steps with at the plain and white kolam stage. 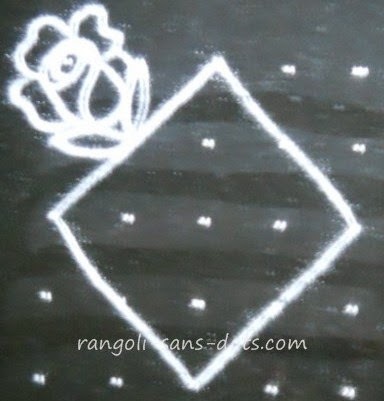 Rose kolam with a 15 to 8 dot pattern is one of the most common rangoli or kolam designs that is drawn quite frequently for special occasions or for festivals like Margazhi and Diwali. It is also drawn for competitions. The dot pattern is 15 to 8 idukku pulli. After placing the dot grid the central design is drawn first and around it the 6 roses are drawn. The central pattern and the patterns for the dots remaining after drawing the roses differ according to one's imagination. 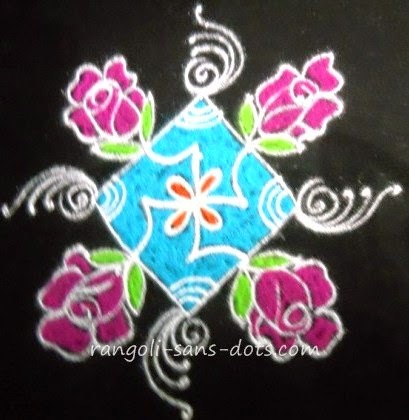 However the rose designs are common in this type of rangoli. 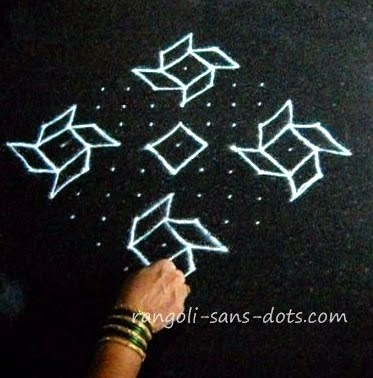 The images showing the intermediate steps in this rangoli will give us an idea for drawing this rangoli. 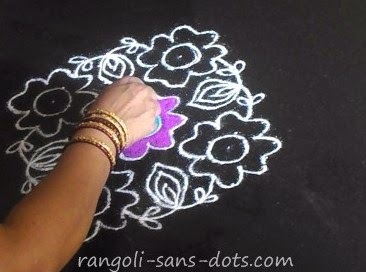 While the rangoli ( or kolam ) can be completed quickly adding colours will take some time and so test out patience. 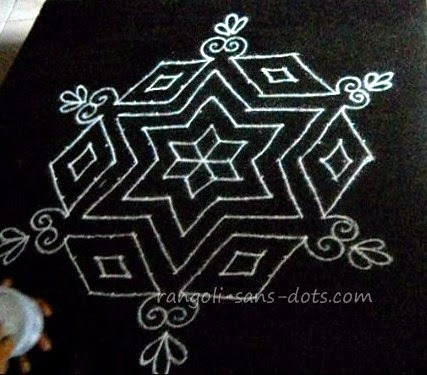 This post had free hand kolam designs for Margazhi. 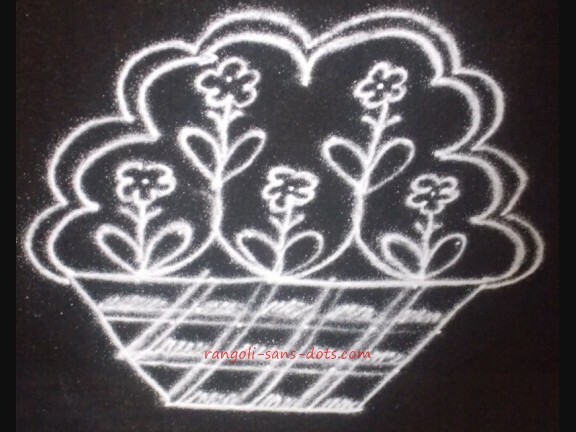 Due to requests I have added some kolam with dots for Margazhi 2014 here. 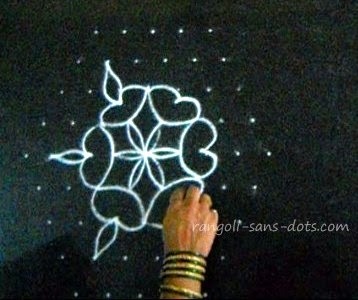 The first kolam is the famous and common rose kolam with dots. We can find it frequently drawn for various occasions and festivals. While rose patterns are similar to what I have drawn the central design varies from person to person depending upon our imagination. The dot pattern used is 15 to 8 idukku pulli. Two images showing intermediate steps for this kolam have also been added. Patterns in kolam represent elements in nature and need not be exact replicas. Just as we have mango leaf patterns that do not look exactly like mango leaves, we can have peacock kolam that represent peacock designs but need look exactly like the beautiful birds. 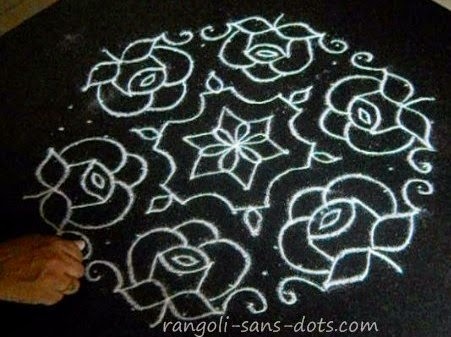 In this aspect I think kolam differs from rangoli. I have chosen an appropriate colour - peacock blue for the birds. 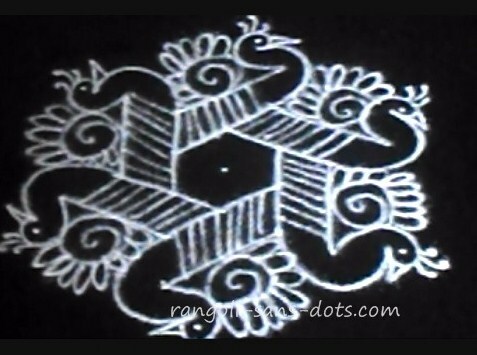 The kolam is drawn with 7 by 4 dots idukku pulli or interlaced dots. The three steps in the kolam are shown in the images or pics below. The images of the birds look like a peacock putting its feathers up! 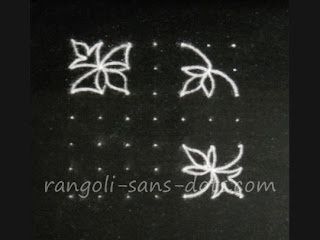 No collection of butterfly rangoli designs can be complete without the common butterfly rangoli with 8 by 8 dot grid. Four butterflies are drawn on four sides with a flower at the centre. 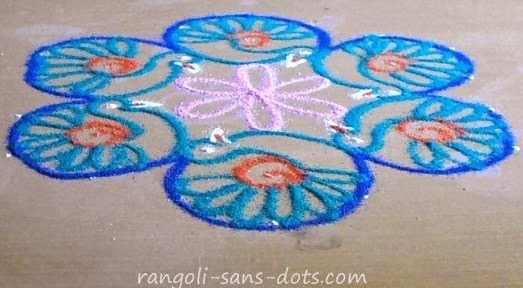 There is another common rangoli with the word WELCOME running vertically and horizontally with the butterflies at the corners. The two images show the intermediate steps. It is better to draw the thorax and antennae of the butterfly before drawing the wings. It is easier that way and one will not get confused. Of course we have to make the final design as colourful as possible also because they are butterflies. 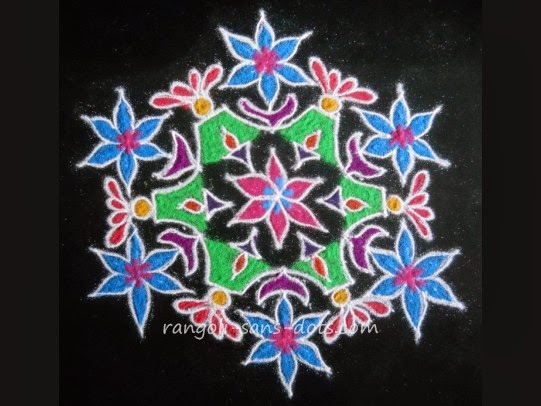 A simple rangoli ( or kolam ) for this festival - Krishna Jayanthi or Sri Jayanthi and I think it is relevant too. Sangu kolam designs are quite common and many patterns can be drawn. 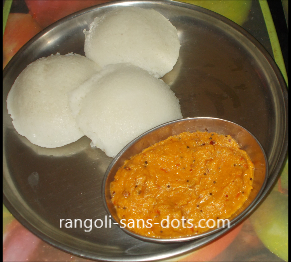 I have chosen the simplest - 2 sangu ( or conch ) with one above and one below. 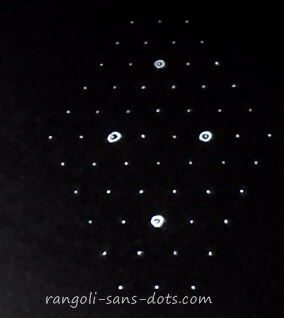 So the dot pattern will 8 dots to 1 (idukku pulli or interlaced dots ). 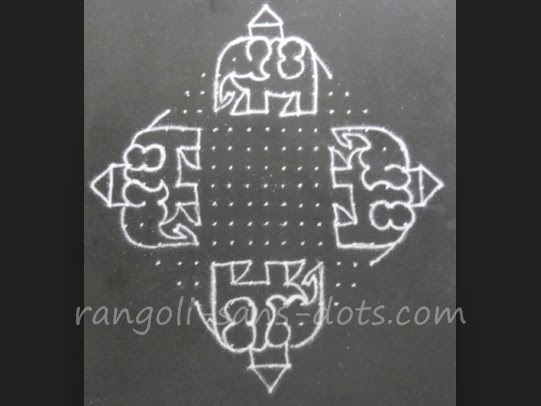 The three images below show the steps for drawing this kolam. 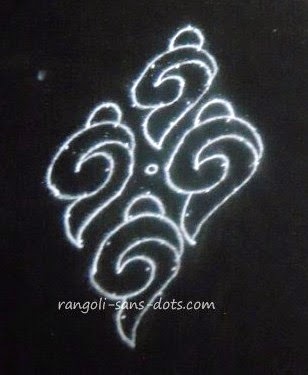 Though it is a simple kolam joining the dots to get the curved lines to get a conch pattern is what is important. 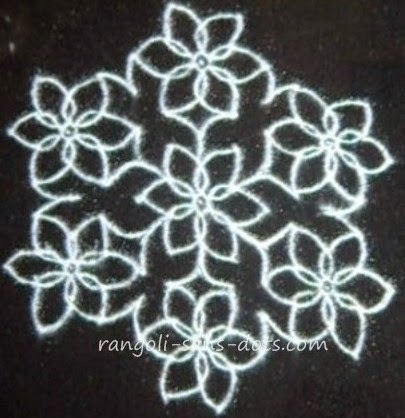 Quite a beautiful kolam that is commonly used as regular designs and for festivals too. The dot grid is 8 to 3 though the patterns can be extended infinitely we are restricting to this dot pattern to make it simple. First we have to mark the four centres of the hexagons that will be formed. They will be 3 row on the either side and 6 row ( two dots ) as shown. Next we should proceed to form the hexagons and mango leaf or maavilai designs. Since there are many hexagon like patterns that are formed closely like a bee hive this kolam is also called theni-koodu kolam by some. After all I have to reiterate that we depend heavily on nature for our kolam designs. 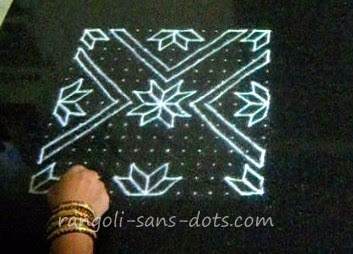 Though it appears simple we can get confused so the images showing many steps to reach the final kolam design. 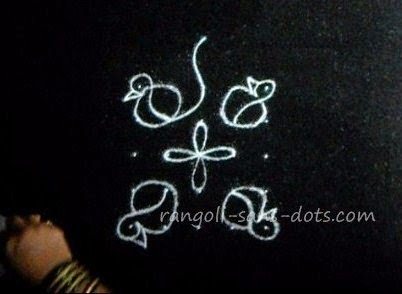 The maavilai patterns can also be used to generate some birds patterns to form a 7 to 4 (idukku pulli ). First draw the straight lines as shown in the first image, then add spiral patterns and floral petals as shown to form the tail. The result a very simple and easy representation of a peacock. Draw the lines as shown we can also decorate the neck portion of the birds. 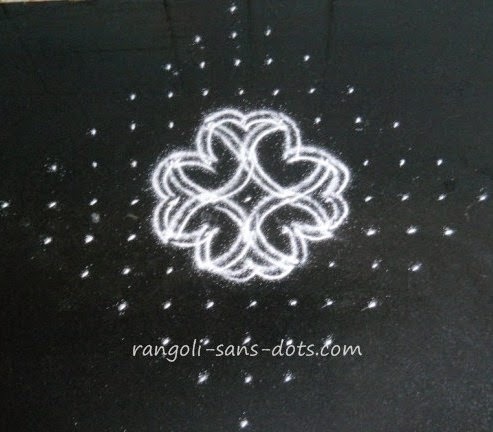 Kolam designs with relatively bigger dot grid are commonly used during Margazhi season. 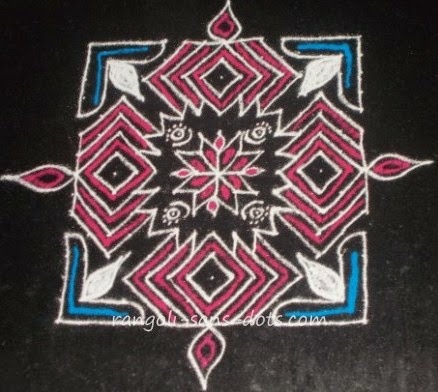 One such common kolam , my kolam is slightly modified when compared with the original version. The theme is using a pair of birds on all four sides with the remaining dots being used up with some simple patterns like flowers, leaves. I have retained the original birds but have modified the other patterns. We can also have birdlings or nestlings too in this kolam. The dot grid is 17 to 1. 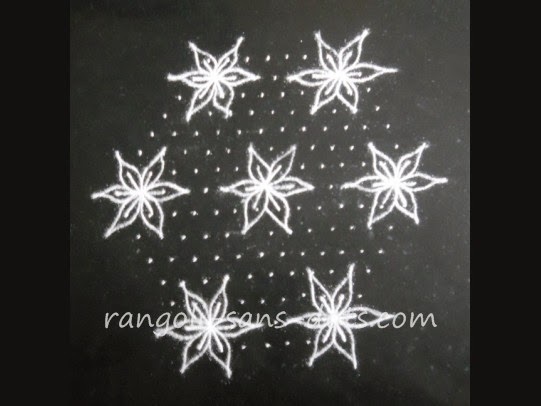 The kolam above is with dots pattern 19 by 9 dots, 11 by 1 on either side and 9 to 4 on either side.The method to draw this through some photos of intermediate designs is available in birds kolam with dots. Draw the floral patterns at the centre and the outside. Then add the birds facing each other with fruits in their beaks. Fill the kolam and the background with colours to get a beautiful and big kolam for the season. This is also a common design. The birds kolam design and other big kolam are usually popular during Margazhi season when we see big and colourful kolam designs for Margazhi kolam decorating many streets. The images above show the intermediate stages of the kolam with four pairs of birds and leaf / petals patterns to give an idea as to how the kolam progresses. As shown in the first photo the floral patterns on the four sides are drawn. Then as in the second photo the pattern at the centre is drawn. 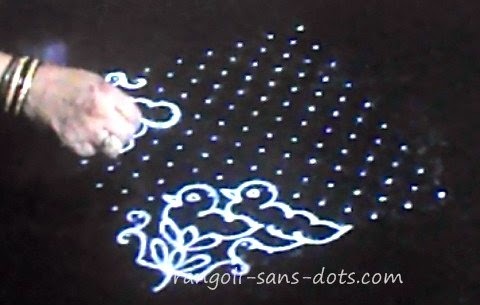 The remaining dots are used to draw the birds. 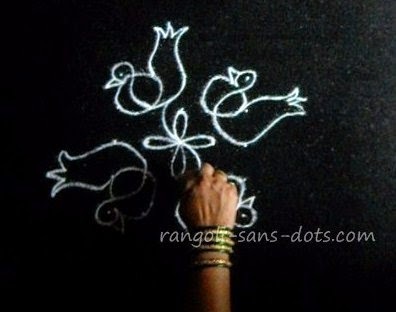 The third kolam photo shows the birds being drawn. 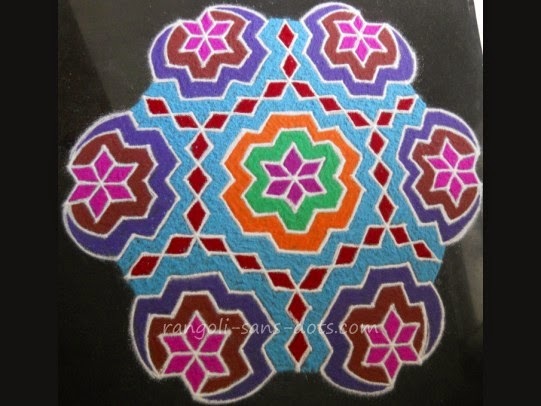 The fourth showing how colours are filled and the fifth the completed kolam. 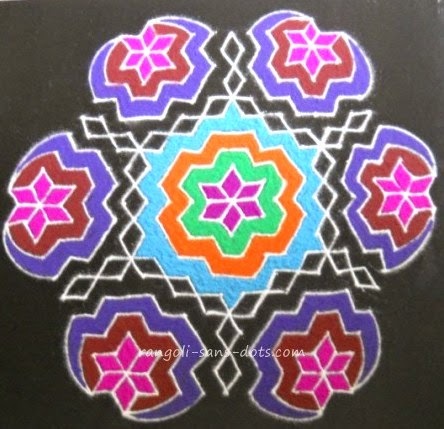 The finished kolam is shown in the image (fifth) after applying the colours This rangoli with dots is of the following pattern 19 x 9 dots, then 11 x 1 on either side and finally 9 x 4 on either side.It takes some time to complete. Colourful birds in nature inspire us to draw colourful rangolis.The background is filled with used rangoli powder. There is a video on my YouTube channel is a series of photos and shows how to go about drawing this design from the dot pattern to the finished step. Finally fill the remaining space with the floral and other motifs . 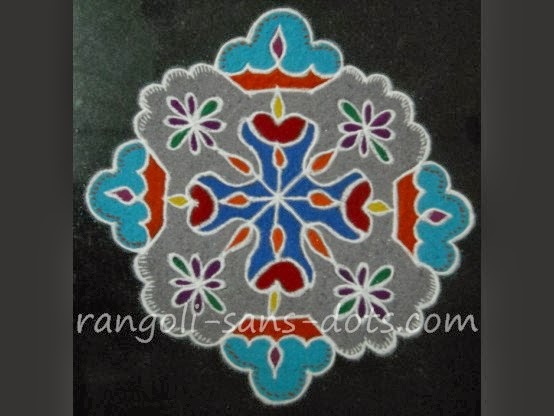 Add colours to the rangoli design as shown in the image above. It can be stopped at this stage. However I have filled the background also with rangoli powder to give an enhanced effect. This will take some time and we need patience to complete it. Care should be taken at all stages of filling the rangoli to ensure that there is no overlapping of one colour over the other. 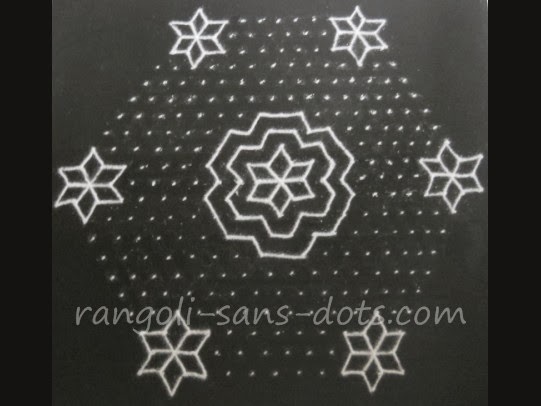 This is a relatively big kolam (or rangoli) with dots. 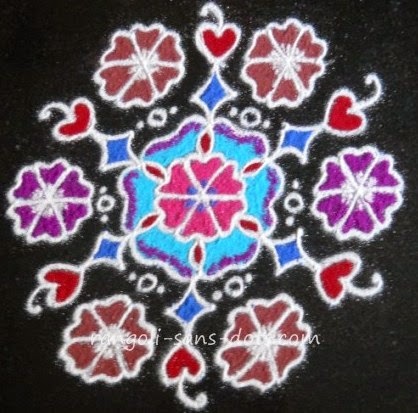 In an earlier post, I had stated that I would use the mixture of colour kolam powder preserved after use. I have done so in this kolam. I hope that you are able to identify it. Actually it is quite easy, isn't it? It only proves that anything has a purpose and can serve a purpose!. Oops!. I do not want to venture into philosophy. Of all the Indian birds the peacock is the most colourful. It has been a source of inspiration for Indians to add a dash of colour where ever possible. My children tell me that the birds like birds of paradise, rainbow lorekeet and macaw are also very colourful. Anyway, colours make the world a better place to live in. The world in black and white is incomprehensible and unthinkable. The rangoli drawn by me are no where close to nature in resplendent colour! This design represents the claws of a scorpion-like insect/animal - in fact it appears as if six are there. This is quite a common kolam design. Since the dot pattern is 21 to 11 it takes quite some time to complete it. They may also represent the claws of a tiger so it is also called puli nagam kolam according to my elder sister who is an expert in rangoli making. 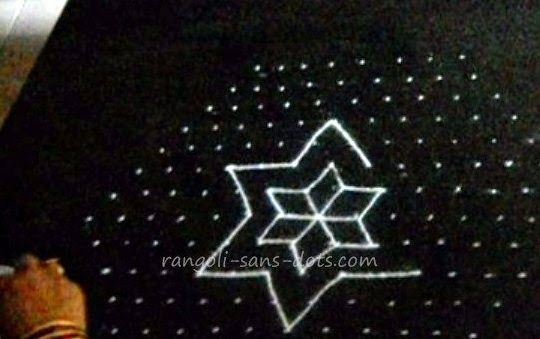 However as in the case of the previous rangoli, in this case too, two intermediate steps of this big rangoli is shown in the photos below. To state the obvious, in the first case the six patterns on the corner and the one at the centre are drawn. Then the lines are connected around or along these patterns using the dots around to get the stage in the second photo. The third photo shows the completed design but without colours. 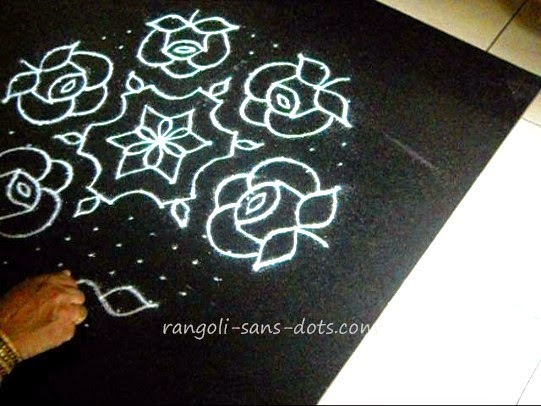 Obviously, the completed rangoli is another common big kolam. Again to complete it with colours, patience is required. If the background is also to be filled one will need 15 minutes extra. 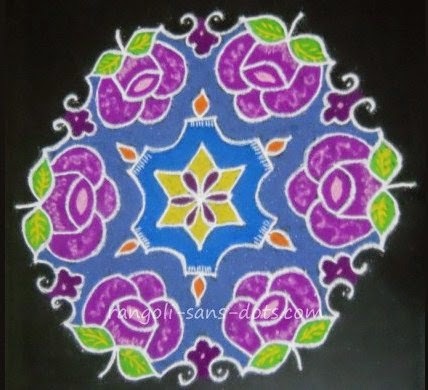 The entire kolam design with colours and the background also in colour is below. 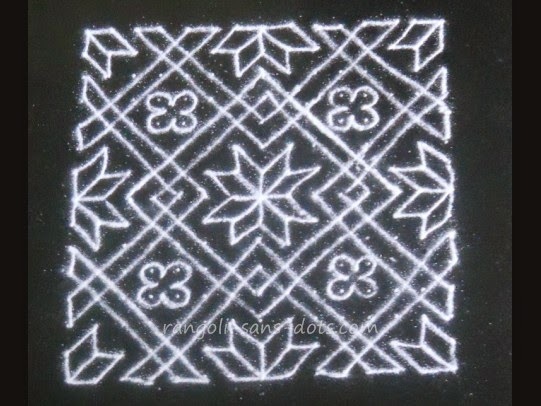 This kolam is called Mandra kappa in Telugu is one of the important muggulu designs drawn during Sankranthi. Draw the claws of the scorpion ( 6 nos) and the pattern in pink. 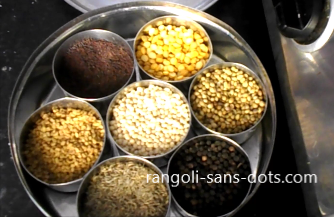 Then draw the central design and fill the remaining dots as shown in the video. Add colours as in the image above to get the design. My mother lived in Vizianagaram a town near Vishakapattinam. 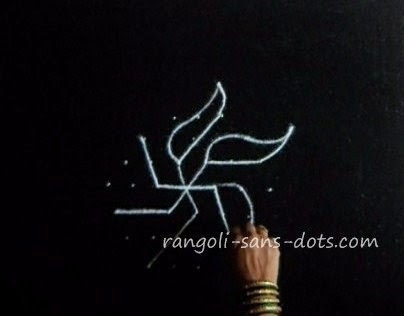 She learnt a lot of rangolis from her mother seven decades back!. In Andhra Pradesh, Sankranti is an important festival. My mother says that they call it Peddha Pandaga in Telugu. 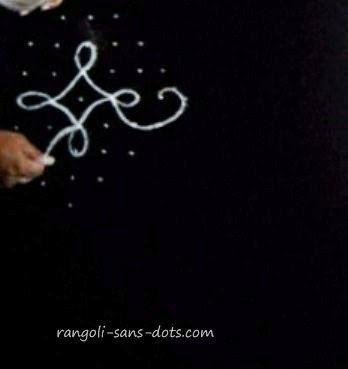 The above rangoli with dots is an important Sankranti Teluginti muggulu (for my mother ) drawn by my mother, taught by her mother (confusing isn't it -, taken from for the people, by the people and of the people !). She says it is called Mandra Kappa ( Telugu for black scorpion - please correct me if I am wrong) because a part of the design resembles the claws of a scorpion. 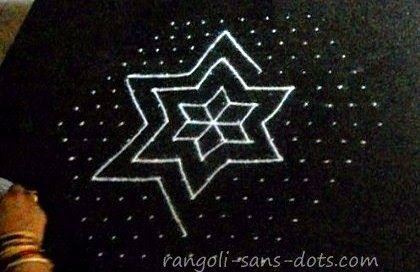 Though the design is simple as we use rhombuses only, it will take a lot of time (90 minutes approx) to complete it because it is a relatively big kolam with dots. 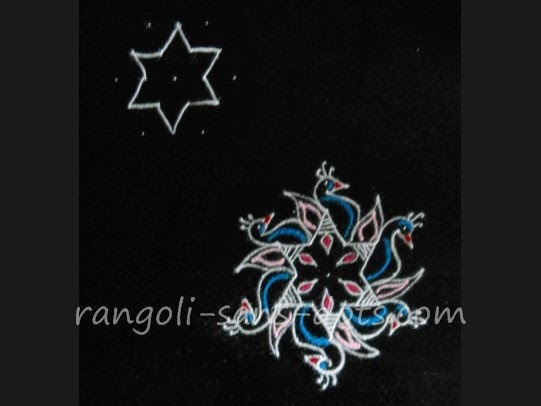 Many stages of the rangoli are shown in the pictures. The the dot pattern is 21 dots to 11 dots (in between dots or idukku pulli). 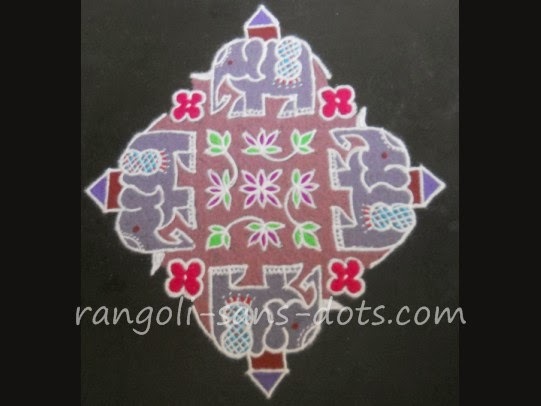 The elephant-rangoli designs is a rangoli with 21 to 1 dots. The video is on my YouTube channel. Two intermediate steps are shown below. The right one with only the elephants and canopied seat (called howdah or ambari ). The gaps between two elephants is filled with a four petal floral design and the tusk as shown in image at the top. That leaves only the dots at the centre. I have filled it with a common floral petal design which with colours filled is available in simple floral patterns. 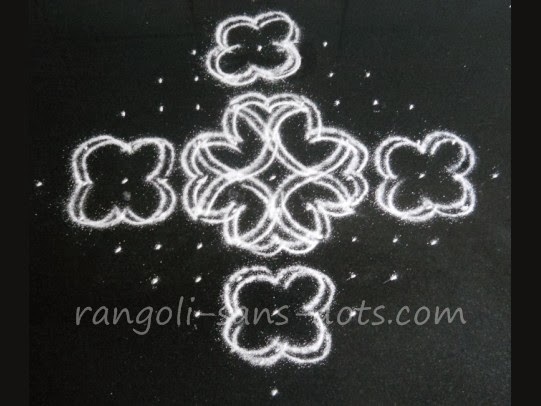 ( Simple kolam designs can be used independently as a kolam or as a part of a bigger kolam ). The first stage shows only the four elephants drawn on four sides with the canopied seat and caparison ( a decorative cloth on the back ) . In the second stage I have added the tusk(s) and floral patterns between the elephants. An image showing filling up the elephant kolam with colours. 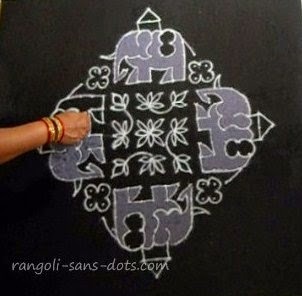 The elephant kolam design is a popular kolam with dots found in public domain. 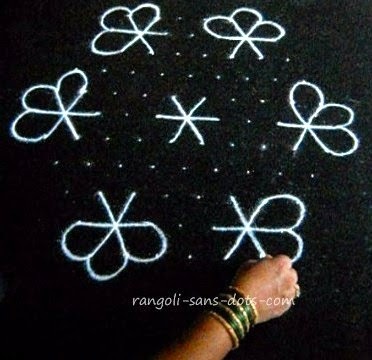 It is also a popular kolam in our family. 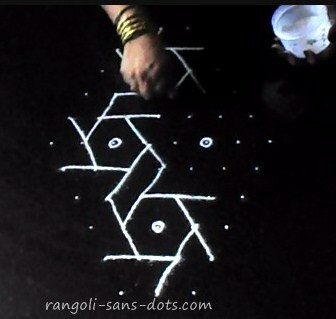 Just as we have "family song" in our movies, there are some rangolis with dots that have been popular in our family for decades. This is one of them.. Another using birds has been shown in an earlier kolam here. More will follow in the future. 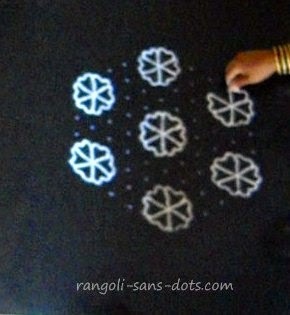 The dot pattern for this rangoli is 21 to 1 (ner pulli). First draw all the elephants one by one. Then the central floral design is drawn and the remaining dots are filled with floral designs. Finally the colours are filled and remaining gaps are filled with some colour, brown in this case. Free hand decorations of the elephant are done to complete the kolam.With 21 dots this can be classified as a big kolam with dots. There are many more kolam that need a dot pattern using 20 and 25 dots. Since drawing them by the traditional method is time consuming, I will update this post as and when I add more rangoli designs of this type to my collection. The designs above are in public domain for at least decades if not for centuries but drawing them is challenging due to the patterns involved and the time taken. If all the patterns are to be finished with colours it takes a longer time. 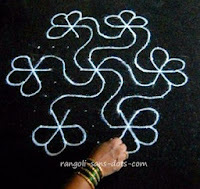 Hence it is usual to find these designs during Margazhi season when kolam making is at its peak in Tamil Nadu. 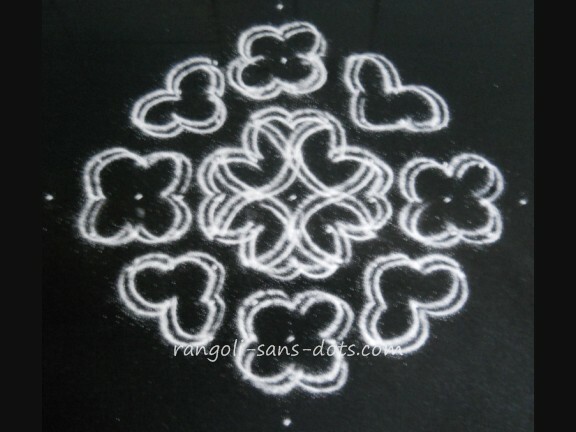 A beautiful collection of a variety of kolam or muggulu designs that can be used for Margazhi kolam with dots, Pongal kolam with dots aka Sankranti muggulu with dots. 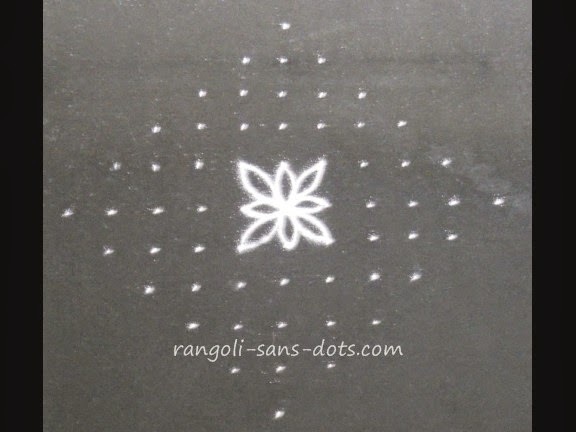 If we are looking for different New Year kolam with dots one these rangoli with dots must be definitely suitable. 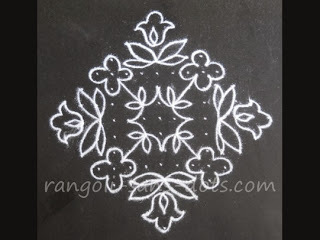 If you like these kolam designs Share them please ! a) Take a stainless steel or porcelain plate or shallow vessel that can hold water. I have used what we call thambalam in Tamil. b) Wash the plate well and then clean it with a clean and dry cloth. 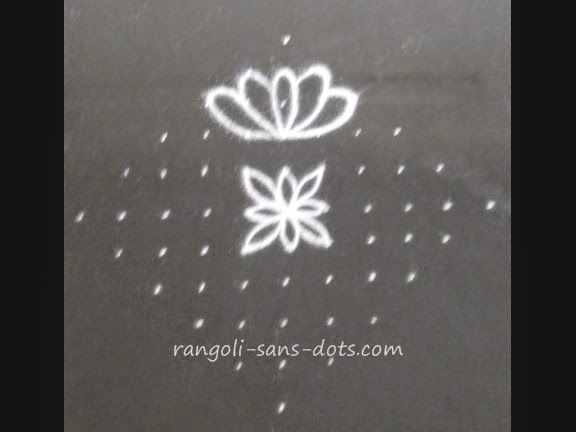 e) The photos from the second to fifth show how the rangoli is drawn using a dot grid. f) I have already explained the steps in Rangolisansdots. However as a recap. Place eight dots around a central dot so that they are equidistant. Now draw five lines of decreasing length above two consecutive dots as shown. Do this between the outer dots to get eight sets of lines. 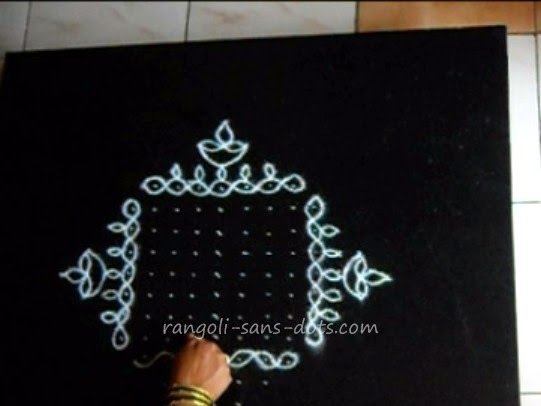 Then connect the right edge of the top line to the top dot on the right and from there go to the right edge of the next line and so on to get the final kolam / rangoli design. 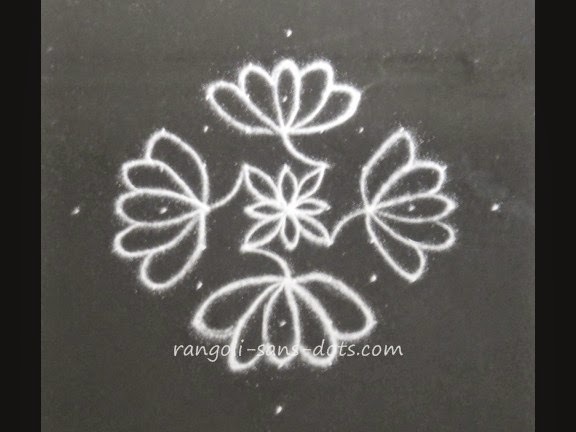 f) After completing the rangoli, gently add water from the rim of the plate ( do not pour ) so that the kolam is covered with water. Add water till the kolam is completely covered with water. 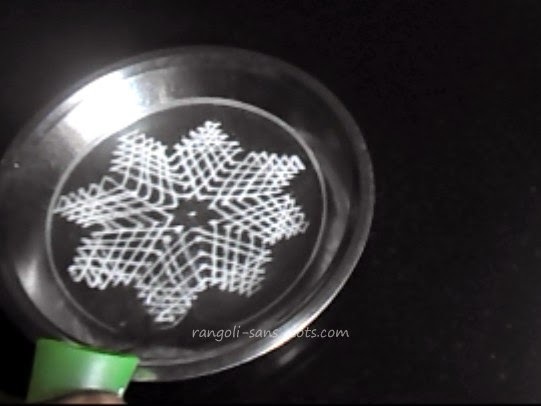 Some particles of kolam are washed away but the design stays sticking to the thin film of oil !. 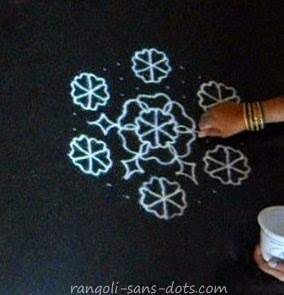 Complete the kolam and add water gently as shown. We know where this art originated - India. The questions why and how have been on my mind for a long time. I do not have the answers only some guesses. 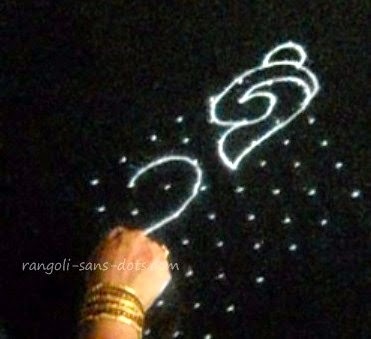 I wonder when the pratice of sprinkling water on the access to a house and drawing a rangoli there, started. Let me think aloud (or should I say write aloud)!.Could it be because in those days electricity was not discovered and light at dawn was insufficient, water was sprinkled to scare reptiles away. Probably, rangolis where drawn with rice flour and turmeric powder to keep the ants and insects at bay. Also, art is an integral part of human life. It has been so for ages. It has been our desire to bring out nature's beauty through art. 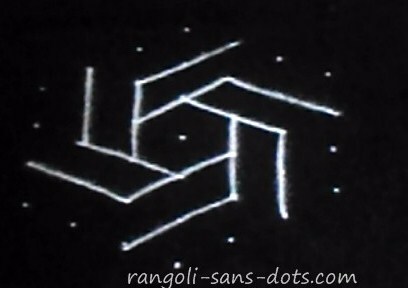 Probably rangoli art also originated due to this quest of us, humans. A wild guess or is it a plausible explanation.? I don't know. I request someone to throw some light on the subject. 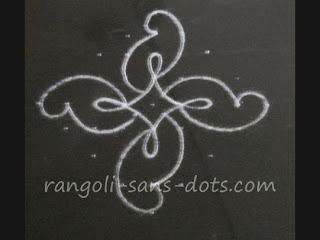 I will add links as and when I find interesting links on rangoli or related information. 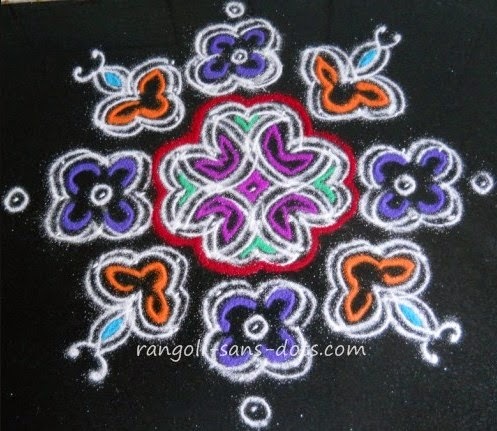 Of course rangoli or kolam is drawn to welcome guests daily or on special occasions, is considered to be auspicious and hence there is a practice in Tamil Nadu and other parts of India of drawing rangoli daily at the entrance. One can get a fair idea of the house based on the rangoli drawn at the centre. 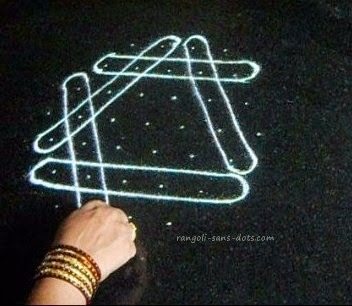 For example if there is padi kolam drawn at the entrance it means that there is a celebration going on in the house. Kolam in Tamil means beauty and in Tamil Nadu the art of kolam is practised by women every morning and some draw it in the evening too. 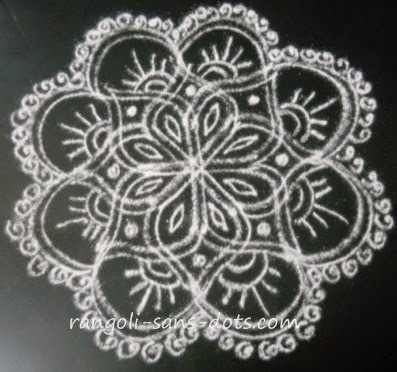 My mother used to say that holding the kolapodi and sprinkling the kolam powder to get the patterns should be done with grace and even this act should look beautiful to one who watches a kolam being drawn . ( Is beauty in the eyes of the beholder ! ) My mother also said that this is a divine art and hence should be practised with the sanctity it deserves. 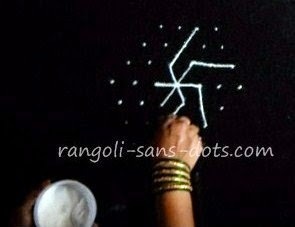 Also, just as a teacher teaches how to hold a pencil in primary school so also she taught how to hold kolam powder. 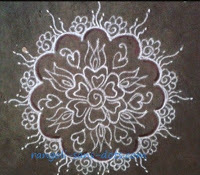 This is a primarily collection or gallery of medium size kolam / muggulu that can be drawn for the following and are kola podi kolam. 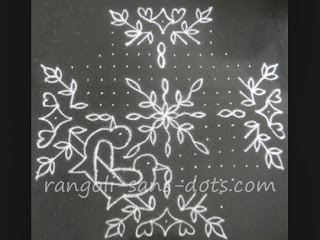 A kolam collection of some common kolam with dots and some designed ( !) by me. 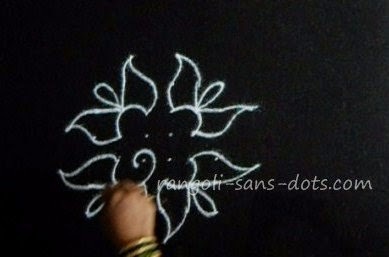 We can all use our own imagination to become a designer of kolam or kolam designer ! 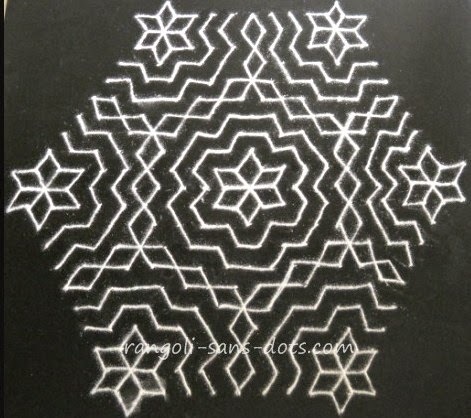 A collection of 30 + + simple kolam ( 4 to 9 dots ) videos - 30 ++ kolam for 30 days in a month is at 30 kolam designs .